Contemporary Posters will be at the first inaugural Pop Art Photo Show which takes place, September 27-30th, at the Barker Hangar in Santa Monica, CA. The show is a four-day celebration of 70+ years of pop culture-influenced expression in an interactive space showcasing extraordinary images of pop culture. Visitors will be able to explore and purchase their favorite rare and vintage art. Contemporary Posters is a New York gallery featuring CYRK... and the Polish School of Posters from the Communist era - recognized as the best in contemporary poster art, comparable to the genius of France's La Belle poque of the 1890s. Encouraged and supported by the Soviet controlled government, the artists of the Polish School were commissioned to create posters on specified themes: CYRK [the quintessential posters of the Polish School as well as exhibit, film, jazz, Jewish, opera, rock, theater and all aspects of the government-run cultural media. Despite strict State censorship, the posters sophisticated visual language often obliquely contained anti-regime messages [hidden meanings]. 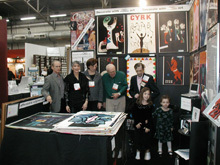 CYRK... art is original limited-edition posters, priced from $125 to $1500 - with most in the $175-$575 range. And, like all fine vintage posters, CYRK... art is linen-backed - a labor intensive process which maintains a poster's integrity. Posters are in mint condition, measure approximately 27" x39" and were printed in Poland by agencies of the cold-war Communist government. In memory of Solidarity s artist - Tomasz Sarnecki the world-famous Solidarity(Solidarnosc) poster will be at Contemporary Posters booth #440 at the 2018 Architectural Digest Design Show [Pier 94, New York City, March 22-25]. Tomasz Sarnecki, who died in Poland on January 2nd, 2018 (at the age of 51) had transformed a publicity still of Gary Cooper striding down the street in the film High Noon into a campaign poster for the crucial 1989 Polish election. This historic vote resulted in the defeat of the Communist bandits and brought to power Lech Walesa and the once outlawed Solidarity Party. In addition to the Solidarity poster, the exhibit will feature CYRK... - both very rare, almost impossible to find as well as extraordinary, but more available- posters by artists of the Polish School represented in the collection of the Museum of Modern Art, NYC. The Polish School of Posters [post World War II (1945) until the fall of Communism (1989)] is recognized as the best in contemporary poster art - comparable to the genius of Frances La Belle poque of the 1890s. Encouraged and supported by the Communist government, the artists of the Polish School of Posters were commissioned to create posters on specified themes: CYRK [the quintessential posters of the Polish School ] as well as exhibit, film, jazz, Jewish, opera, theater and all aspects of the government-run cultural media. Despite strict State censorship, the posters sophisticated visual language often obliquely contained anti-regime messages [hidden meanings]. 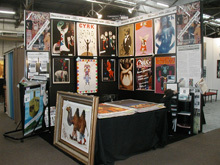 CYRK... art is original limited-edition posters, priced from $150 to $1500 - with most in the $175-$575 range. And, like all fine vintage posters, CYRK... art is archival linen-backed - a labor-intensive process which maintains a poster's integrity. Posters are in mint/near mind condition, usually measure approximately 27" x39" and were printed in Poland by agencies of the Communist government. CYRK... artists represented in the collection of the Museum of Modern Art, NYC will be featured at Contemporary Postersbooth #440 at the 2018 Architectural Digest Design Show [Pier 94, New York City, March 22-25]. In addition, some of the 100+ Communist era posters and artists on view were part of MoMA's recent Polish Posters 1945-89 exhibition. Besides the many very rare, almost impossible to find posters [part of Contemporary Posters platinum collection] as well as other extraordinary, but more available, posters, the exhibit will also consist of : a documentary film, Freedom on the Fence, about the Polish School of Posters which was playing at the MoMA poster exhibit; photos of awardwinning settings forDecorating with CYRK... art; and posters for Contemporary Posters' California exhibits which are complimentary to customers as part of a special show promotion. 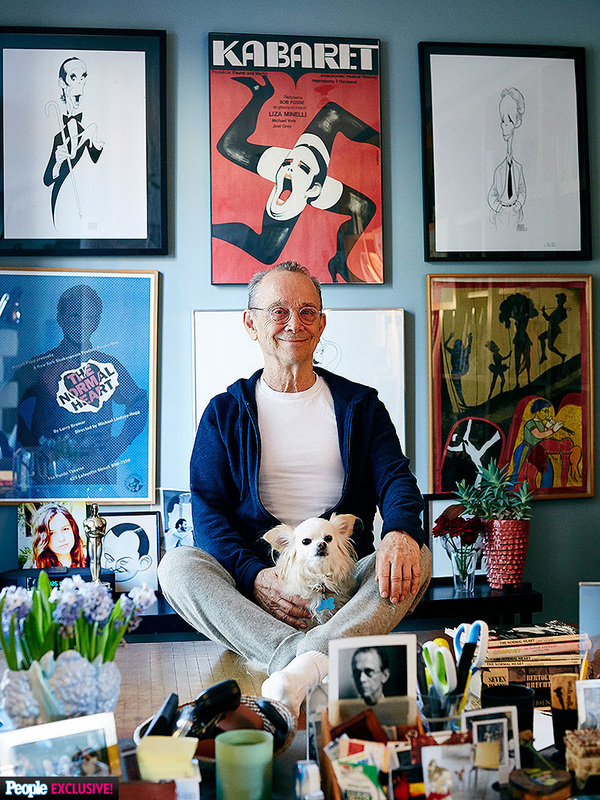 CYRK... art was used effectively as the focal point [from l to r] in a Joel Grey's studio office, a European sitting room, a winter chalet and a modern bedroom. These are just a few examples of successfully Decorating with CYRK... art - the theme of Contemporary Posters' exhibit at the 2017 New York Architectural Digest Design Show- [March 16st-19th, Pier 94, NYC]. Contemporary Postersbooth #440 is offering for sale 100+ distinct images including many very rare, almost impossible to find posters part of the platinum collection - from the golden age of the world-renown Polish School of Posters. The artists of the Polish School were encouraged and supported by the Communist government, to create posters on specified themes to promote: CYRK [the quintessential posters of the Polish School] as well as exhibit, film, jazz, Jewish, opera, theater and all other aspects of the government-run cultural media. Decorating with art is a well-recognized way of creating unique and attractive surroundings. And CYRK... art - considered the best in contemporary poster art, comparable to Frances La Belle poque of the 1890s - is a striking and affordable way to enhance any location. Whether placed singly or in a group, CYRK... posters with their compelling graphic images and wide range of styles, subjects, messages and coloring can augment great design in a variety of dcors. Several posters as well as most artists were included in the exhibit Polish Posters 1945-89 at MoMA (Museum of Modern Art, NYC) or are part of the Museums collection. 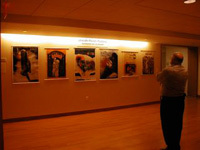 In addition, on view are: a documentary film, Freedom on the Fence, about the Polish School of Posters which was playing at the MoMA installation; an original painting (maquette) from which a poster was created; and two posters for Contemporary Posters' California exhibits which are offered complimentary to customers as part of a special show promotion. CYRK... art is original limited-edition posters, priced from $125 to $1200 - with most in the $160-$600 range. And, like all fine vintage posters, CYRK... art is linen-backed - a labor intensive process which maintains a poster's integrity. Posters are in mint condition, measure approximately 27" x39" and were printed in Poland by agencies of the cold-war Communist government. An exhibit of CYRK... - Polish School of Posters - protest art from the Communist era will be at Contemporary Posters booth #440 at the 2017 Architectural Digest Design Show [Pier 94, New York City, March 16th-19th]. These posters, though not overtly anti-government, are creative, aesthetically pleasing vehicles for coded subversion. And the artists, despite receiving State support and being subject to strict censorship, often were able to use their street art to convey negative messages about the Soviet- dominated regime. The hidden meanings contained in the posters are as varied as the art: from Jan Lenicas famous design for Wozzeck that screamed out the message of Polish suffering; to the CYRKposters in which [from l to r] Hubert Hilscher intimates how all is upside down and unstable under Communism, Jan Sawka eludes to the prayers of the Poles for the fall of the USSR imposed bureaucracy and Waldemar Swierzy not only questions reality but also hides numerous Vs the martial law banned victory sign; to finally, Tomasz Sarnecki's Solidarity poster that openly called for a vote to end Communism. In addition to the politically and historically significant messages of protest, the Polish School of Posters [post World War II (1945) until the fall of Communism (1989)] also became recognized as the best in contemporary poster art - comparable to the genius of Frances La Belle poque of the 1890s. Many of the 100+ CYRK... original limited-edition posters and artists displayed are part of MoMA's (Museum of Modern Art, NYC) collection. In addition, some of the posters and artists were also included at the Museums recent Polish Posters 1945-89 exhibition. Also, on view are: a documentary film, Freedom on the Fence, which focuses on the surreptitiousness of the art of the Polish School of Posters; photos of awardwinning settings for Decorating with CYRK... art; and posters for Contemporary Posters' California exhibits which are complimentary to customers as part of a special show promotion. CYRK... art is original limited-edition posters, priced from $125 to $1200 - with most in the $160-$600range. And, like all fine vintage posters, CYRK... art is archival linen-backed - a labor-intensive process which maintains a poster's integrity. Posters are in mint/near mind condition, usually measure approximately 27" x39" and were printed in Poland by agencies of the Communist government. The Museum of Modern Arts collection of the Polish School of Posters will be featured at Contemporary Posters booth #440 at the 2016 Architectural Digest Design Show [Pier 94, New York City, March 17th - 20th]. Many of the 100+ Communist era CYRK... original limited-edition posters and artists on view are part of MoMA s collection. In addition, some of the posters and artists were also included at the Museums recent Polish Posters 1945-89 exhibition. Besides the Museums posters and artists, many very rare - almost impossible to find posters [part of Contemporary Posters platinum collection] - on view, also, are: other extraordinary, but more available, posters; a documentary film, Freedom on the Fence , about the Polish School of Posters which was playing at the MoMA poster exhibit; photos of awardwinning settings for Decorating with CYRK... art ; and posters for Contemporary Posters' California exhibits which are complimentary to customers as part of a special show promotion. Art/design TRENDS, recognized at the 2015 Architectural Digest/ Home Design Show [Pier 94, New York City, March 19th–22nd], include curves and unexpected colour combinations. Many of the over 100 Communist era CYRK…original limited-edition art posters on view at Contemporary Posters’ booth #436 forecasted these 2015 TRENDS. Similarly, the posters at the Museum of Modern Art [NYC] recent Polish Posters 1945-89 exhibition reflected this stylistic prophesy. Two posters at both exhibits - Mona Lisa (1970)by Maciej Urbaniec and Wozzeck (1964)by Jan Lenica - [pictured above] exemplify how CYRK… artists were precursors to the current art/design TRENDS of flowing lines and palette surprises. Urbaniec (1925-2004) in Mona Lisa uses dissonant color combinations with ingenious humorous artistic metaphors to attract attention to his subtle but powerful message that an ideal society would merge the esoteric art of Leonardo da Vinci with the more mundane art of the circus. Lenica 1928-2001 in Wozzeck, through a rhythmic linear technique, dramatic contrasts of red and black undulating lines plus the provocative joining of the real and surreal; combines the musicality of Berg’s opera with the decorativeness of Art Noveau, to create a ubiquitous anguished cry of the central figure. In addition to these two iconic oeuvres, also on view are: a diverse selection of other very rare, almost impossible to find posters – part of the platinum collection; a documentary film, Freedom on the Fence, about the Polish School of Posters that was playing at the MoMA installation; an original painting (maquette) from which a poster was created and posters for Contemporary Posters' California exhibits which are complimentary to customers as part of a special show promotion. The Polish School of Posters [post World War II (1945) until the fall of Communism (1989)] is recognized as the best in contemporary poster art - comparable to the genius of France’s La Belle Époque of the 1890s. Encouraged and supported by the Communist government, the artistsof thePolish School of Posters were commissioned to create posters on specified themes:CYRK [the quintessential posters of the Polish School] as well as exhibit, film, jazz, Jewish, opera, theater and all aspects of the government-run cultural media. 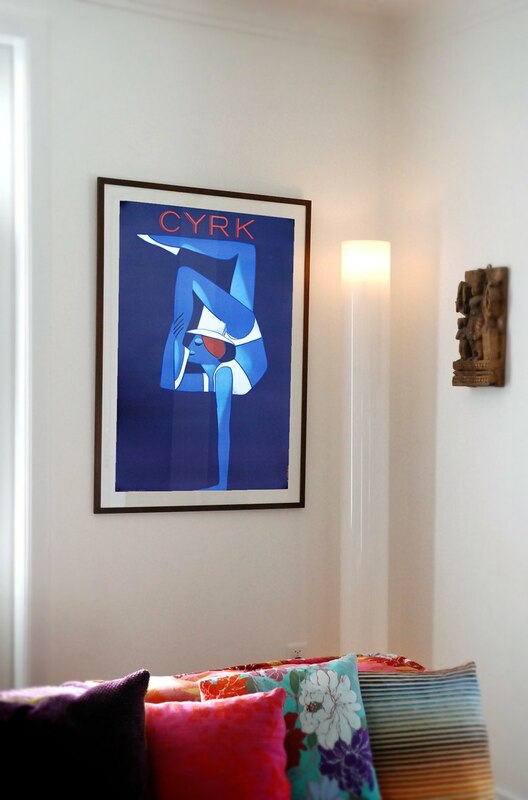 CYRK…art is original limited-edition posters, priced from $150 to $1200 - with most in the $175-$575 range. And, like all fine vintage posters, CYRK… art is linen-backed - a labor-intensive process which maintains a poster's integrity. Posters are in mint/near mind condition, measure 27" x39" and were printed in Poland by agencies of the Communist government. 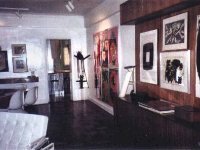 CYRK... art was used effectively to convert a Fire Island home from a dull non-descript collection of rooms to an exciting interior space. 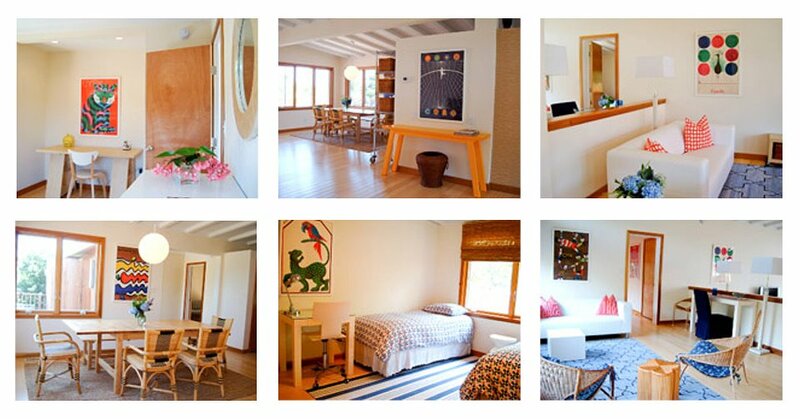 The owners aptly described the transformation : " your posters are the best part of our new home. We had bland white walls, lots of minimally furnished space -- your posters made the space vibrant. They really pop against the mostly neutral background. We love them!" Decorating with CYRK... art will be the theme of the Contemporary Posters' exhibit at the 2015 New York Architectural Digest Home Design Show. CYRK... art, original contemporary/vintage posters from the world renowned Polish School of Posters, [post World War II (1945) until the fall of Communism (1989)] is recognized as the best in contemporary poster art - comparable to France's La Belle poque of the 1890s. Encouraged and supported by the Communist government, the artists of the Polish School of Posters were commissioned to create posters on specified themes: CYRK [the quintessential posters of the Polish School] as well as exhibit, film, jazz, Jewish, opera, theater and all aspects of the government-run cultural media. CYRK... art is a striking and affordable way to enhance any room in your home or office. Whether placed singly or in a group, CYRK... posters, with their compelling graphic images and wide range of styles, subjects, messages and coloring lend themselves to countless locations. Styles range from real to surreal, subjects from abstract to animals, coloring from pale to psychedelic and messages from clear to cryptic. CYRK... art is original limited-edition posters, priced from $125 to $1200 - with most in the $160-$575 range. And, like all fine vintage posters, CYRK... art is linen-backed - a labor intensive process which maintains a poster's integrity. Posters are in mint condition, measure approximately 27" x39" and were printed in Poland by agencies of the cold-war Communist government. Contemporary Posters, a division of Prior Products Inc., founded in 1933, is a New York company specializing in the art of the Polish School. The end of World War II marked the dawn of a new period in the development of Polish poster art, which became known as the Polish School of Posters. The recently installed Communist regime began commissioning artists to design posters not only with social and political messages, but also and more prominently to promote the many aspects of the government-run cultural media: concerts, exhibitions, film, jazz, opera, theater, etc. 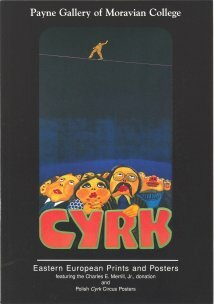 and the circus (cyrk in Polish). Building sites throughout Poland were enclosed with wooden fences, which were quickly covered with posters. These fences served as billboards and events notices as well as support for the art of the street. Circus became both the most internationally recognized and acclaimed subject depicted by the Polish School of Posters. 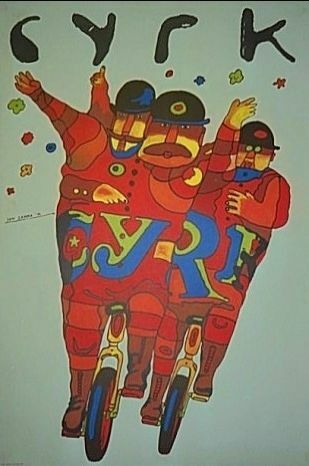 The first "Cyrk" posters appeared in 1962, when the ZPR (Zjednoczone Przedsi?biorstwa Rozrywkowe, or United Entertainment Entreprises), the state agency that oversaw the circus, commissioned leading artists to develop a modern approach to the circus poster. The ZPR wanted a revised look for the circus poster to parallel the circus's efforts to upgrade its image. These new circus posters were not to be advertisements presenting concrete objects, people, or facts; but rather, they were to be artistic renderings reminding the public that an exciting and contemporary circus was coming to town. Based usually on a single theme, their metaphors and allusions created a wonderful artistic expression that, in addition to being viewed, were to be read, pondered, and digested. Cyrk posters became known for their mastery of certain specific qualities of the Polish School: painterly gestures, linear design, lettering, clever metaphors, humor, as well as vibrant colors. The significance of the circus as a cultural form during the Communist period in Poland (1946-1989), and the importance of these Cyrk posters, is attested to by the issuance of a postage stamp in 2002 with the image of the Mona Lisa circus poster by Maciej Urabaniec. The post-war political systems in Poland greatly influenced the development of polish poster design. Beginning in 1945, Poland was known as the Polish Peoples Republic, and was governed by a Soviet-supported Communist regime. Under this government, such media as the circus and the poster were given an exalted status, but they were subject to almost complete censorship. In the 1960s, Poland achieved relative political autonomy from the USSR, and culture increasingly became the center of public life. The State, as both patron and controller of the arts, gave recognition to posters as an art form. While the States patronage supported the poster, the States encouragement created its success. This encouragement took many forms, including establishing education in poster design at polish colleges of art, and organizing national poster competitions throughout Poland. During this period, poster design became a well-recognized profession, attracting artists from various disciplines: print making, photography, illustration, sculpture, and painting; all of which contributed to the development of the Polish poster. The 1970s witnessed a lessening of direct State supervision of the media, resulting in State-owned publishers exerting less and less influence over poster content. The political turmoil of the 1970s and 1980s further removed posters from governmental restraints. In this atmosphere of greater artistic freedom, poster design flourished; it became more dynamic, more expressive, and more artistic. Posters also became more intellectual and challenging as artists smuggled their own ideas into works still supported by the State. Finally, in 1989, the fall of Communism in Poland and the introduction of a free market economy brought with it the end of an era the end of the importance of the State-supported circus, and the end of the golden age of the Polish School of Posters. The First Generation (post-World War II): The founders were Jozef Mroszczak (1910-1975), Henryk Tomaszewski (b.1914) and Tadeusz Trepkowski (1914-1954). Each contributed to its unique style: a painters palette, the quick sketch full of humor, strong coloring, surrealistic metaphors, concise composition and use of symbolism. The Second Generation (the 1950s and 1960s): These artists, born in the 1920s and 1930s, include Roman Cieslewicz, Wiktor Gorka, Hubert Hilscher, Tadeusz Jodlowski, Jan Lenica, Jan Mlodozeniec, Marian Stachurski, Waldemar Swierzy, and Maciej Urbaniec. They continued the work of the First Generation, but in a more restrained, intellectual style. Some drew upon the fantastic and surreal while others favored abstraction. The Third Generation (the 1960s-1980s): Born during and after World War II, these artists include Jerzy Czerniawski, Stasys Eidrigevicius, Marek Freudenreich, Rafal Olbinski, Andrzej Pagowski, Jan Sawka, and Wieslaw Walkuski. They introduced more aggressive designs intended to surprise, provoke or disturb the viewers beliefs and values. Their works often use camouflage and commonly understood ironies to communicate surreptitiously with the public. 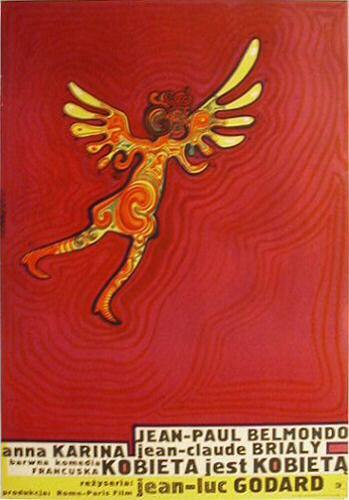 This generation firmly established the Polish School of Posters reputation throughout the international art community. Circopedia.org has 48 CYRK... posters on their image gallery. 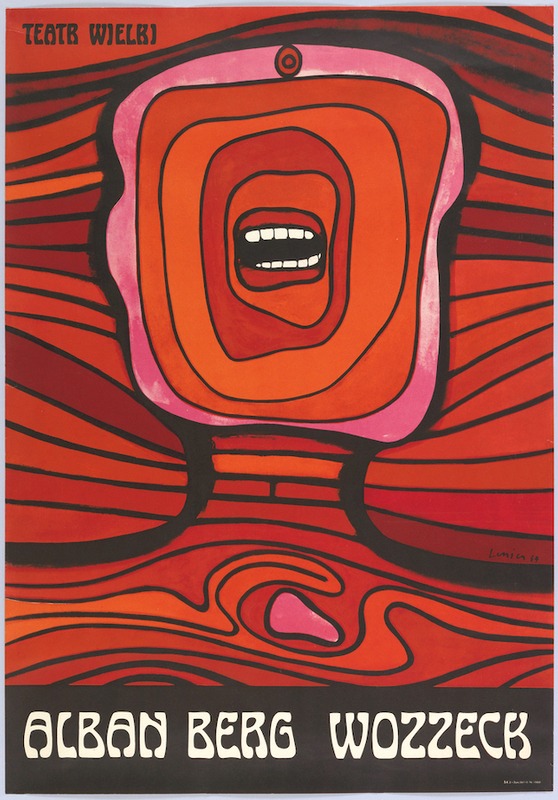 Wozzeck (1964), an original limited-edition opera poster by Jan Lenica, which has been likened - artistically and thematically - to Edvard Munch's The Scream, is on view at Contemporary Posters' booth at the 2013 Architectural Digest Home Design Show [March 21st-24th, Pier 94, New York City]. Lenica's Communist era 'Scream' figure of protestation - similar to its more famous predecessor - is the iconic oeuvre of the artist, was recognized by its home country with an official postage stamp and was featured in a recent exhibit at New York's Museum of Modern Art. Like Munch's masterpiece currently at MoMA, Wozzeck had demanded attention during the museum's Polish Posters 1945-89 exhibition. The poster is also an impressive presence at the Contemporary Posters' space among the 100+ distinct contemporary/vintage CYRK posters from the world-renown Polish School of Posters. Several other images at the Design Show as well as most artists had been part of the MoMA display. The Polish School of Posters [post World War II (1945) until the fall of Communism (1989)] is recognized as the best in contemporary poster art - comparable to the genius of France's La Belle �poque of the 1890s. Encouraged and supported by the Communist government, the artists of the Polish School of Posters were commissioned to create posters on specified themes: CYRK [the quintessential posters of the Polish School] as well as exhibit, film, jazz, Jewish, opera, theater and all aspects of the government-run cultural media. 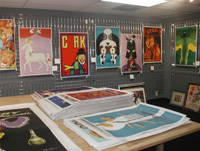 In addition to the CYRK posters, also on view are: a documentary film, Freedom on the Fence, about the Polish School of Posters that was playing at the MoMA installation; an original painting (maquette) from which a poster was created; and two posters for recent Contemporary Posters' California exhibits which are complimentary to customers as part of a special show promotion. Jan Lenica (1928-2001) was one of the leading poster artists of Poland during the Cold War era. His style is known for its dramatic color contrasts, flowing linear technique and provocative character joining the real and surreal. Wozzeck, with its red and black undulating lines, epitomizes Lenica's art combining the harmonic musicality of Berg's opera with the exquisite decorativeness of Art Noveau and the ubiquitous anguished cry of the figure. CYRK... art is original limited-edition posters, priced from $125 to $1800 - with most in the $150-$575 range. And, like all fine vintage posters, CYRK... art is linen-backed - a labor-intensive process which maintains a poster's integrity. Posters are in mint/near mint condition, measure 27" x39" and were printed in Poland by agencies of the Communist government. 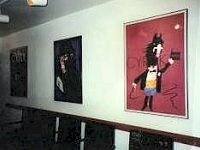 CYRK... art was used effectively to convert a Fire Island home from a dull non-descript collection of rooms to an exciting interior space. The owners aptly described the transformation : " your posters are the best part of our new home. 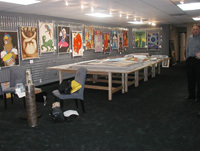 We had bland white walls, lots of minimally furnished space -- your posters made the space vibrant. They really pop against the mostly neutral background. We love them!" Decorating with CYRK... art will be the theme of the Contemporary Posters' exhibit at the 2012 New York Architectural Digest Home Design Show. CYRK... art is original limited-edition posters, priced from $125 to $1500 - with most in the $160-$575 range. And, like all fine vintage posters, CYRK... art is linen-backed - a labor intensive process which maintains a poster's integrity. Posters are in mint condition, measure approximately 27" x39" and were printed in Poland by agencies of the cold-war Communist government. Mona Lisa (1970) by Maciej Urbaniec - part of a MoMA 2009 exhibit - is one of the 100+ original CYRK... vintage posters to be offered for sale by Contemporary Posters at the 2011 New York Architectural Digest Home Design Show. The six month Museum of Modern Art show entitled Polish Posters 1945-89 featured a selection from the museum's collection which "typify the striking look and bold spirit of Polish poster design" many of which "carried powerful, oblique commentaries on the designers' political surroundings." The Polish School of Posters [post World War II (1945) until the fall of Communism (1989)] is recognized as the best in contemporary poster art - comparable to the genius of France's La Belle poque of the 1890s. Encouraged and supported by the Communist government, the artists of the Polish School of Posters were commissioned to create posters on specified themes: CYRK (the quintessential posters of the Polish School) as well as exhibit, film, jazz, Jewish, opera, theater and all aspects of the government-run cultural media. Maciej Urbaniec (1925-2004) was one of the leading artists of Poland during the Cold War era. His style, as seen in Mona Lisa, conveys simple and powerful messages through an ingenious humorous methodology with artistic metaphors. In Mona Lisa, Urbaniec conveys his concept of a post-Communist ideal society which would combine the esoteric art of Leonardo da Vinci with the more mundane art of the circus. As a tribute to the popularity of this poster, the Republic of Poland issued a postage stamp in 2002 bearing its image. CYRK... art is original limited-edition posters, priced from $125 to $1800 - with most in the $150-$575 range. And, like all fine vintage posters, CYRK... art is linen-backed - a labor intensive process which maintains a poster's integrity. Posters are in excellent condition, measure 27" x39" and were printed in Poland by agencies of the Communist government. Click below for full MoMA release. Posters of the world-famous Polish School of Posters will be on view at the Daniel Aubry Gallery from November 13th December 31st, 2010 . It is the gallery's 2nd exhibit and 1st large-scale exhibit of original posters from the golden age of Polish poster art (1950s-1980s). Also on view will be a DVD showing a documentary film about the Polish School of Posters entitled Freedom on the Fence which was part of the MoMA installation. The Polish School of Posters [post World War II (1945) until the fall of Communism (1989)] is recognized as the best in contemporary poster art - comparable to France's La Belle poque of the 1890s. It was encouraged and supported by the government under Communism which employed more than 75 Polish artists to create posters on specified themes: CYRK (the quintessential posters of the Polish School of Posters) as well as exhibit, film, jazz, Jewish, opera, theater, etc. CYRK... art are original limited-edition posters, priced from $125 to $1800 - with most in the $150-$475 range. Posters are in excellent condition, measure 27" x39" and were printed in Poland by agencies of the Communist government. And, like all fine vintage posters, CYRK... art is linen-backed - a labor intensive process which maintains a poster's integrity ($75+ retail value). Original contemporary art posters of the world-famous Polish School of Posters created for the Kaminski Jewish Theater in Warsaw are on view in Los Angeles at the Weidman Gallery from April 25 - June 15, 2009. The current exhibit of original posters from the golden age of Polish poster art (1950s-1980s) is even bigger and more exciting than last year's inaugural single gallery presentation. The Polish Poster Festival LA, encompasses the art of the most popular genres of the Polish School: Jewish, jazz, CYRK, film, exhibit and entertainment (theater, opera & music) . In addition, film posters are on display at Laemmle Sunset 5 Theatre in conjunction with the Polish Film Festival LA as well as other Laemmle Theatres as part of the Los Angeles Jewish Film Festival. Posters can also be seen at Warszawa Restaurant, Santa Monica. This year's promotional poster by the Polish/American artist Leonard Konopelski is based on the design of the previous two years It will be shown at the gala opening of the Polish Film Festival LA as well as other places throughout Los Angeles. The Weidman Gallery has been featuring contemporary and vintage posters as well as custom framing since 1963. 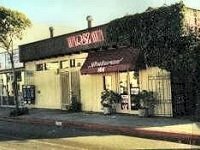 Its current location in trendy West Hollywood is a 5000 square foot facility at 7772 Santa Monica Boulevard (www.weidmangallery.com). The Polish Poster Festival LA was organized by Contemporary Posters, New York (www.contemporaryposters.com) a company specializing in the art of the Polish School of Posters. The posters date primarily from the Communist period, an era of award-winning poster art in Poland.. Under Communism, the government employed artists to create posters on various subjects including the state-controlled media: theater, opera, film, circus, etc. With the encouragement and sponsorship of the Soviet supported regime, these artists became recognized as the best in contemporary poster art, possessing a genius comparable to France's La Belle poque of the 1890s. All posters are original, limited editions, priced from $135 and linen-backed (as are all fine antique vintage posters). CYRK... affordable original art to achieve great design! Contemporary Posters' booth #866 at the New York Architectural Digest/Home Design Show, March 26th-29th, Pier 94 (12th Av. & 55th St.), will display 100+ different original contemporary/vintage CYRK... posters including many rare (one-of-a-kind) posters) from the world renowned Polish School of Posters. Many posters will have their prices slashed to as much as 50% to 'stimulate' sales. Decorating with art is a well-recognized way of creating unique and attractive surroundings. CYRK... posters, with their compelling graphic images and wide range of styles, subjects, messages & coloring lend themselves to various & countless locations. Styles range from real to surreal, subjects from abstract to animals, coloring from pale to psychedelic and messages from clear to cryptic. And, as art primarily of the 1950s-80s, CYRK...posters are perfect in modernist interiors. On view, also, will be a DVD showing a documentary film about the Polish School of Posters entitled Freedom on the Fence, contest winning photos of posters in various home and office settings as well as two posters designed by Leonard Konopelski, an artist of the Polish School of Posters, for recent Contemporary Posters' California exhibits. In addition, there will be original paintings from which two 1970s posters were created. CYRK... original. affordable, art posters measure approximately 27"w x 39"h and are priced from $95 to $1800 with most posters in the $150 - $450 range. Posters were printed in Poland from 1950-1989 in limited quantities, by agencies of the government and are in mint condition. And, like all fine vintage posters, CYRK... art is linen-backed - a labor intensive process which maintains a poster's current characteristics ($75+ retail value). Contemporary Posters' mission is to promote contemporary posters as an art form in the U.S.; in other countries, they are well recognized and collected as art. Contemporary/vintage posters-are the antique/vintage posters of tomorrow...the art investment for the future! A powerful collection of Jewish-Polish Poster Art will be on display in the art gallery at the Westchester Jewish Center, in Mamaroneck, beginning February 22nd. Dating from post World War II to the 1990s, these vintage/antique posters are on loan from Contemporary Posters, a Polish Poster concern in New York. After World War II, many Polish museums and galleries had been destroyed or closed and the wooden fences that hemmed building sites took their place. During this postwar period through the 1980s, the simple metaphors and emotional, political commentary inherent in Poster art flourished at the Warsaw Academy of Fine Arts. The line between art and design blurred. Using commonly understood ironies and various degrees of symbolism, Polish posters not only became a national tradition, they dominated their genre, promoting art exhibits, films, opera and theater. In the years of Communist rule in the late 1940s and 50s, posters were used as Soviet propaganda but also moved poster design further into the realm of fine art. The most highly-acclaimed of these posters centered around the circus, or CYRK, and were known for their painterly, vibrant gestures, hand-lettering and humor, as well as their subtle messages. But another theme emerged as important to the medium: Jewish art. After the decimation of Poland's Jewish community during the Holocaust, the Communist government displayed a strong interest in the Jewish arts and commissioned many posters centering on Jewish themes. (Jewish culture had always been an integral part of Polish culture.) Communist rule in 1960s led to the State taking over as controller of the poster machine while further elevating the role of culture in public life. Education in poster design spread among Polish art schools and national poster competitions abounded, attracting artists in print-making, photography, illustration, sculpture and painting. The state-controlled E.R. 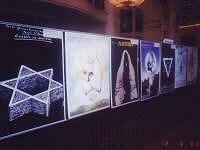 Kaminski National Jewish Theater, which was formed soon after the WWII, began commissioning posters in the 1970s to accompany many of their productions. Startling and aggressive designs that provoked and surprised became de rigueur. The free market economy that emerged in Poland in the 1990s changed the role of the poster. Commercialism supplanted art. Posters became mainly advertising vehicles. Polish Poster Art originality faded. The rise of capitalism led to the demise of the Golden Age of the Polish School of Posters, but it also bred a revitalization of Jewish culture and a forum for the continued production of award-winning poster art, a practice that continues to this day. April 30: Klezmer night with Yale Strom, world-renowned musician, storyteller and film maker. 7:30 pm at WJC. Posters of the world-famous Polish School of Posters are on view in Los Angeles at the Weidman Gallery from April 22 - June 30, 2008. It is California's first large-scale exhibit of original posters from the golden age of Polish poster art (1950s-1980s) to take place in a single gallery. The Polish Poster Festival LA encompasses the art of the most popular genres of the Polish School: Jewish, jazz, CYRK, film, exhibit and entertainment (theater, opera & music). In addition, film posters are on display at Laemmle Sunset 5 Theatre in conjunction with the Polish Film Festival LA as well as other Laemmle Theatres as part of the Los Angeles Jewish Film Festival. Posters can also be seen at Warszawa Restaurant, Santa Monica. A reception at the Weidman Gallery on Saturday, May 17th from 7:00 to 9:00pm includes a Polish vodka tasting. Representatives of the Consulate General of the Republic of Poland Los Angeles and the Polish-American artist Leonard Konopelski, the Festival poster's creator, will be present. The Weidman Gallery has been featuring contemporary and vintage posters as well as custom framing since 1963. It recently moved from its location on La Cienega Boulevard to a new 5000 square foot facility in trendy West Hollywood at 7772 Santa Monica Boulevard (www.weidmangallery.com). The Long Beach Shakespeare Company is proud to announce its new show of great original poster art from the world-famous Polish School of Posters the best in contemporary poster art. Dramatic interpretations from Theatre, Jazz, Opera, Ballet and Cyrk (Circus). Between 6:30 and 7:30, our gallery lobby will be welcoming First Friday neighbors. Come take a look, and take a piece of art and history home with you. Prices from $125 with 20% of the proceeds to benefit the Long Beach Shakespeare Company. Our next production, The Bacchae, Euripides' classic Greek tragedy, opens May 9 and runs through June 14. While you're at the theatre, pick up advance half-price tickets available only at the box office. Visit our website at www.lbshakespeare.org Call 562-437-1443 to view the posters by appointment. the best in contemporary poster art a great way to achieve great design! 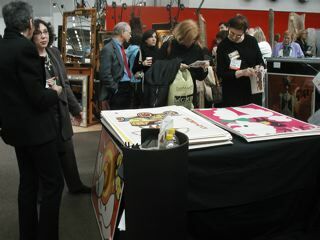 Contemporary Posters' booth (#854) at the New York Architectural Digest Home Design Show - Pier 94 (12th Av. & 55th St.), March 6th-9th - will display 100+ different original contemporary/vintage CYRK...posters including many rare (one-of-a-kind) posters from the world renowned Polish School of Posters. A DVD will be playing Freedom on the Fence, a documentary film about the Polish School of Posters. On view, also, will be a sampling of posters recently exhibited in California galleries during the Los Angeles and San Diego Polish poster festivals as well as posters created for these events. In addition, there will be contest winning photos of posters in various settings along with suggestions for achieving great design in any room in a home or office with CYRK...art posters. Decorating with art is a well-recognized way of creating unique and attractive surroundings. CYRK... posters, with their compelling graphic images and wide range of styles, subjects, messages and coloring lend themselves to various and countless locations. Styles range from real to surreal, subjects from abstract to animals, coloring from pale to psychedelic and messages from clear to cryptic. And as original art primarily of the 1950s-80s, CYRK... posters are ideal complements to mid-century modern and contemporary interiors and are exciting accents to more traditional settings. The Polish School of Posters [post World War II (1945) until the fall of Communism (1989)] is recognized as the best in contemporary poster art - comparable to France's La Belle poque of the 1890s. It was encouraged and supported by the government under Communism which employed more than 75 Polish artists to create posters on specified themes: CYRK (the quintessential posters of the Polish School of Posters) as well as exhibit, film, jazz, Jewish, music, opera, theater, travel and zoo. Original CYRK... posters usually measure approximately 27"w x 39"h and are still very affordably priced from $125 to $575. All are in excellent condition, were printed in Poland from 1950-1989 in limited quantities by agencies of the government and are archival linen-backed (as are all fine posters). Contemporary Posters web gallery can be viewed 24/7 at www.contemporaryposters.com. Contemporary Posters' mission is to promote contemporary posters as an art form in the U.S.; in other countries, they are well recognized and collected as art. Contemporary/vintage posters-are the antique/vintage posters of tomorrow...the art investment for the future! Parkers' Posters and Contemporary Posters of New York City will be presenting an exhibition and sale of original vintage Polish entertainment posters from November 29, 2007 through January 31, 2008 at Parkers' Posters Gallery. 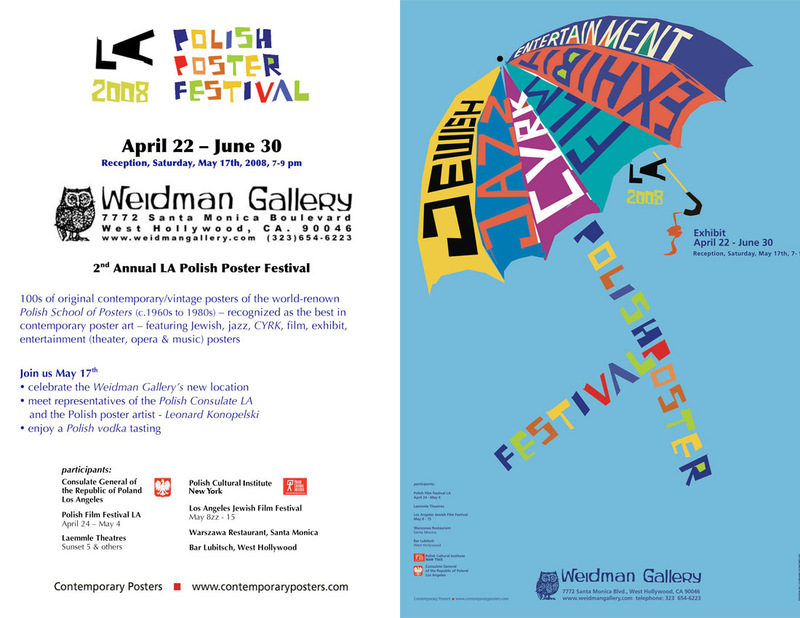 Ylain and Donald Mayer, renowned owners of Contemporary Posters will be at the gala grand opening on Friday evening, November 30, 2007, to answer questions about the Polish School of Posters. Highlighting the evening will be a tasting of Polish vodka and pickles at the grand opening. The opening event will be from 5:00 to 8:00 PM. Come see a very large collection of colorful, entertaining and thought provoking Polish School of Posters art from the communist era in Poland including many hidden message pieces and CYRK posters. Viewing is at our Gallery at 4010 Morena Boulevard in San Diego, suite 105. SAN DIEGO The Gotthelf Art Gallery, part of the San Diego Center for Jewish Culture at the Lawrence Family Jewish Community Center, Jacobs Family Campus, is pleased to announce the new exhibition Jewish/Polish Posters: Communist Era to Present, a Collection of Contemporary Posters, New York, running November 29, 2007 through February 22, 2008. 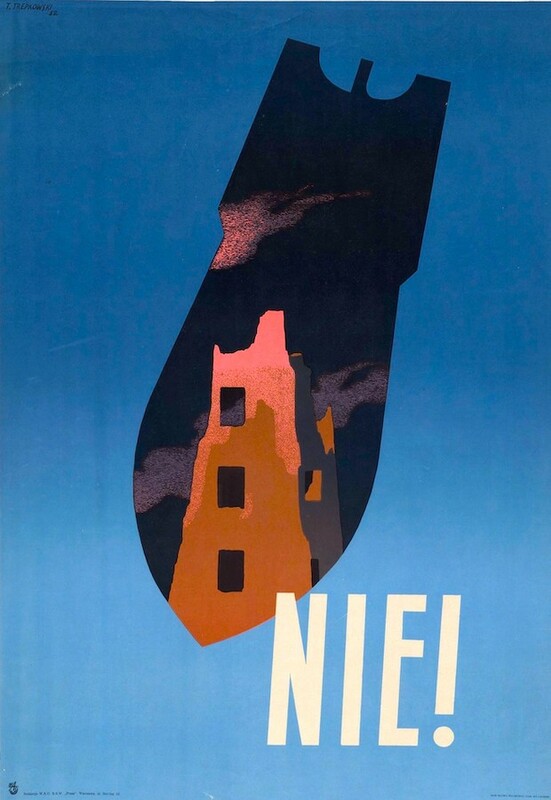 Jewish themed posters produced during the post-war Communist era and since 1989 encompass a diversity of fields including exhibits, festivals, books, film, opera, and theatre. These posters are recognized as the best in contemporary poster art. They are more than aloof graphic designs; their images not only capture the essence of the subject, but also contain the artists' commentaries. Thus, the art of the world-famous Polish School of Posters should be more than viewed; it should be read, pondered, and digested. A free tour with Ylain and Donald Mayer of Contemporary Posters, New York, will be conducted on the opening night of the exhibition, Thursday, November 29, 2007, at 7:30 p.m.
A free Senior Docent Training Session and Tour will be conducted on November 30, 2007 at noon. For information on this event and to RSVP, call 858-362-1154 or visit the web site at www.sdcjc.lfjcc.org. Additional docent tours will be added upon request. A San Diego Jewish Film Festival Screening of "Freedom on the Fence" will be held on February 8, 2008 at 10:30 a.m., followed by a Polish brunch with panel discussion and docent tours. Tickets for this event are $10.50 - $12.50 and may be purchased by calling the JCC Box Office at 858-362-1348. Collaborating partners are the San Diego Jewish Film Festival, Polish Art and Culture Society of San Diego, Consulate General of the Republic of Poland, Los Angeles, and the Polish Cultural Institute. Polish posters are also exhibited by Parkers' Posters, San Diego, and Lyric Opera at the Birch North Park Theatre. The Gotthelf Art Gallery is devoted to expanding and enriching cultural life in San Diego by presenting the finest in Jewish artistic expressions, encouraging the preservation of Jewish culture and heritage, and nurturing new creativity in the arts. The Lawrence Family Jewish Community Center, Jacobs Family Campus, is located at 4126 Executive Drive, La Jolla. Gallery hours are Monday-Friday, 10 a.m. -5 p.m. and Sunday 12 noon 5 p.m. For more information about the Gotthelf Art Gallery and other programs of the San Diego Center for Jewish Culture, visit the web site at www.sdcjc.lfjcc.org. The San Diego Center for Jewish Culture is the largest Jewish institution in San Diego dedicated solely to presenting high quality, nationally recognized programs which are unique to San Diego County. The mission of the SDCJC is to expand and enrich cultural life in San Diego by presenting the finest in Jewish artistic expression, encouraging the preservation of Jewish culture and heritage, and nurturing new creativity in the arts. A core belief of the SDCJC is to promote respect for diverse cultures and build community tolerance. The SDCJC offers a wide variety of multi-disciplinary artistic programs that explore cultural identities and perspectives, promote cross cultural understanding, and highlight human themes of family, tolerance, compassion, and hope. These programs, including the San Diego Jewish Film Festival, the San Diego Jewish Book Fair, New Jewish Plays Project, the San Diego Jewish Music Festival, a Holocaust Education Program, and the J*Company Youth Theatre, foster ideas of cultural appreciation and respect. Its facilities feature a 500-seat theatre, a Judaica library, an art gallery, and a community Holocaust Memorial Garden. Approximately 40,000 tickets are sold or provided annually to residents, visitors, and students for San Diego Center for Jewish Culture events. The mission of the Lawrence Family Jewish Community Center is to provide social, cultural, educational, and recreational programs to individuals and families of all ages, religions, races, and financial, physical and mental abilities. Likewise, the JCC provides equal opportunity employment to individuals of all religions and backgrounds. The JCC welcomes San Diego's diverse Jewish community and the community at large. The Lawrence Family Jewish Community Center is located at 4126 Executive Drive in La Jolla. Posters of the world-famous Polish School of Posters will be on view in San Diego from November 29, 2007 - February 22, 2008. It will be the city's first large-scale exhibition of original contemporary/vintage Polish posters from both the Communist and post-Communist eras. 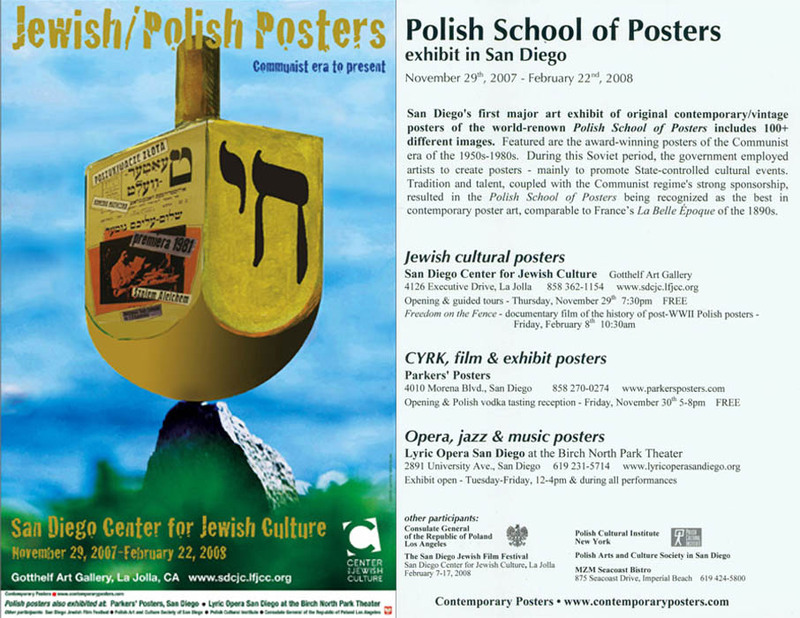 The three art exhibits encompass many genres of the Polish School of Posters: Jewish themed posters at the San Diego Center for Jewish Culture-Gotthelf Art Gallery; Opera, Jazz & Music Posters at the Lyric Opera San Diego at the Birch North Park Theater and CYRK, Film & Exhibit Posters at Parkers' Posters. Most of the posters date from the 1960s through the 1980s, years of award-winning poster art in Poland. During this period, the Communist government employed artists to create posters on various subjects including the State-controlled film, theater & opera. With the encouragement and sponsorship of the Soviet supported regime, these artists became recognized as the best in contemporary poster art, possessing a genius comparable to France's La Belle poque of the 1890s. 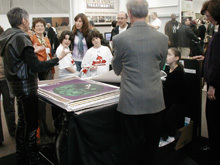 The 3 exhibits were organized by Contemporary Posters, New York, a company specializing in the art of the Polish School of Posters, www.contemporaryposters.com. All posters are original, limited editions, priced from $135 and linen-backed - as are all fine antique vintage posters. Opening receptions will be held at the Center for Jewish Culture on Thursday, Nov. 29th at 7:30 pm; at Parkers' Posters on Friday, Nov. 30th between 5-8 pm; and the Lyric Opera on Saturday, Dec. 1st. Other special events including gallery tours will take place during the exhibits at all three venues. The Polish-American artist Leonard Konopelski, a professor at the Pasadena Art Center College of Design, California, created a limited edition poster in the tradition of the Polish School of Posters. It will be available for sale at the Center for Jewish Culture during the exhibit. The Consulate General of the Republic of Poland presented a Certificate of recognition to the organizers of the Polish Poster Festival LA 2007 in a brief ceremony on April 24th preceding the evening's screenings of the Los Angeles Film Festival at the University of Judaism, Bel Air, California. Krystyna Tokarska-Biernacik, the Consul General of the Republic of Poland in Los Angeles, thanked Ylain and Donald Mayer and their firm, Contemporary Posters, NY, for conceiving and putting together the Polish Poster Festival LA 2007. They Mayers' acceptance of the award included praise for all eight participants and singled out the University of Judaism for special recognition. 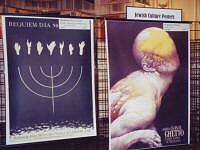 Their exhibit of post-World War II Jewish/Polish cultural posters jas served as the lynchpin for the Poster Festival. The Polish Poster Festival LA 2007 is California's first large-scale exhibition of original posters from the golden age of Polish poster art (1950s-1980s). In addition to the University of Judaism, posters are on view through May 27th at: the Weidman Gallery - entertainment (film, theater & opera) posters and the Voila Gallery - exhibit posters. Posters can also be seen at Bar Lubitsch and Warszawa Restaurant as well as at the Laemmle Sunset 5 Theater in conjunction with the Polish Film Festival LA. The exhibitions at Track 16 Gallery and The Jazz Bakery are now closed. The posters date primarily from the 1950s through the 1980s, an era of prize-winning poster art in Poland. During this period, the Communist government employed artists to create posters on various subjects including the state- controlled theater, opera, film, circus, as well as Jewish-themed cultural posters. With the encouragement and sponsorship of the Soviet supported regime, Polish posters became recognized as the best in contemporary poster art, comparable to France's La Belle poque of the 1890s. 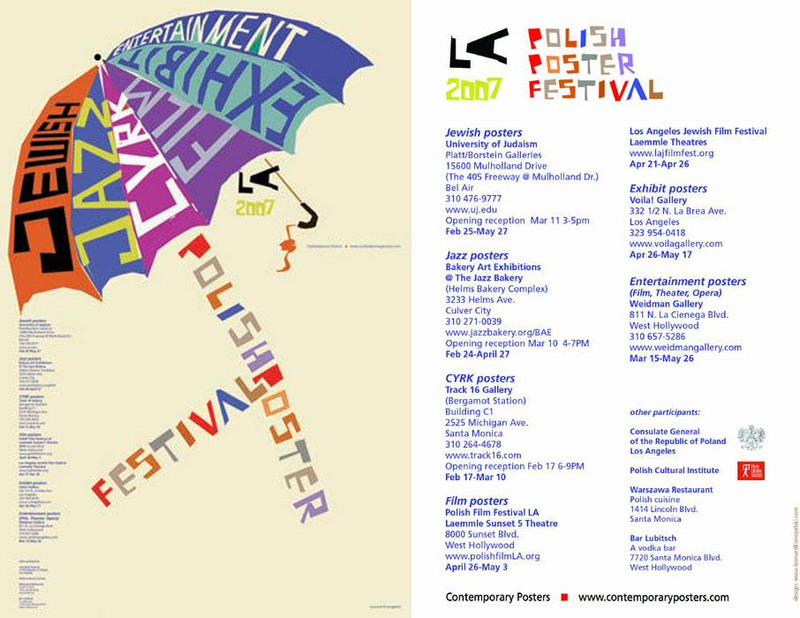 The announcement poster for the Polish Poster Festival LA 2007 was created by the Polish-American artist Leonard Konopelski, a professor at the Pasadena Art Center College of Design. Bothe the Consulate General of the Republic of Poland in LA and the Polish Cultural Institure have given their support to the Poster Festival. Posters of the world-famous Polish School of Posters continue to be on view throughout Los Angeles. California's first large-scale exhibition of original posters from the golden age of Polish poster art (1950s-1980s) began February 17th and will conclude on May 27th. Additional locales for viewing posters now have been added. 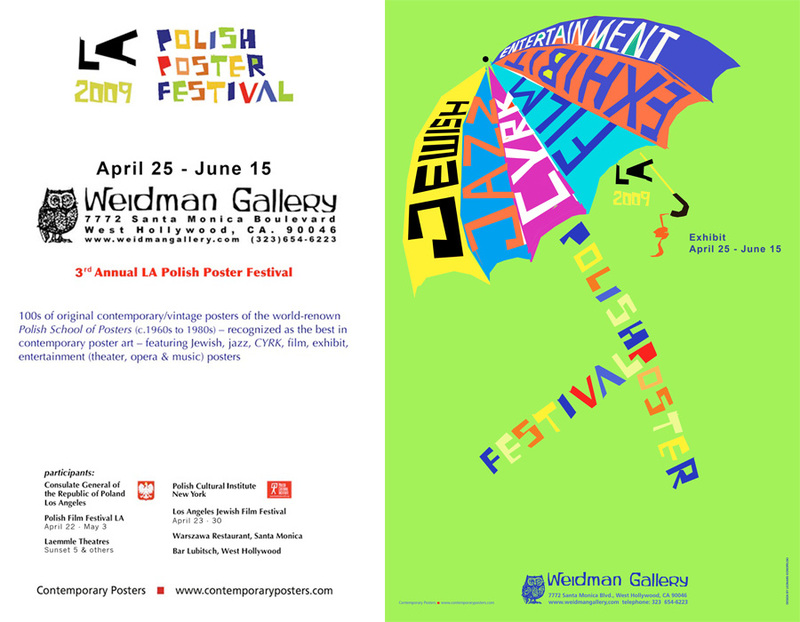 As of April 26th, two Los Angeles art galleries will be exhibiting posters of the Polish School of Posters: the Weidman Gallery - entertainment (film, theater & opera) posters and the Voila Gallery - exhibit posters. In addition, film posters will be displayed at the Laemmle Sunset 5 Theater in conjunction with the Polish Film Festival LA (April 26th May 3rd) and the Los Angeles Jewish Film Festival (April 21st-26th). The Polish Poster Festival LA opened in February with exhibitions of CYRK posters at Track 16 Gallery Santa Monica (closed March 10th), jazz posters at The Jazz Bakery, Culver City (through April 27th) and a major Jewish poster exhibition at the University of Judaism, Bel Air (through May 27th). Posters also will continue to be on view at Bar Lubitsch, West Hollywood and at Warszawa Restaurant, Santa Monica. The posters date primarily from the 1960s through the 1980s, an era of award-winning poster art in Poland. During this period, the Communist government employed artists to create posters on various subjects including the state-controlled film, theater, opera and circus. With the encouragement and sponsorship of the Soviet supported regime, these artists became recognized as the best in contemporary poster art, possessing a genius comparable to France's La Belle poque of the 1890s. The Polish Poster Festival LA was organized by Contemporary Posters, New York (www.contemporaryposters.com) a company specializing in the art of the Polish School of Posters. All posters are original, limited editions, priced from $135 and linen-backed (as are all fine antique vintage posters). The Polish-American artist Leonard Konopelski, a professor at the Pasadena Art Center College of Design, created the announcement poster in the tradition of the Polish School of Posters. Both the Consulate General of the Republic of Poland Los Angeles and the Polish Cultural Institute have given their support to the Festival. For further information on the Polish Poster Festival LA contact Contemporary Posters- 212 724-7722, www.contemporaryposters.com. Posters of the world-famous Polish School of Posters will be on view throughout Los Angeles from February 17-May 27 , 2007. It will be California's first large-scale exhibition of original posters from the golden age of Polish poster art (1950s-1980s). The Polish Poster Festival LA opens with exhibitions of 80 CYRK posters at Track 16 Gallery, Santa Monica on February 17th, 40 jazz posters at the Jazz Bakery, Culver City on February 24th and 40 Jewish posters at the University of Judaism, Bel Air on February 25th. Then, in March and April, two Los Angeles art galleries will display posters: the Weidman Gallery - entertainment (film, theater & opera) and the Voila Gallery - exhibit posters. In addition, film posters will be presented at select Laemmle Theaters in conjunction with the Polish Film Festival LA and the Los Angeles Jewish Film Festival. Posters will also be on view at Bar Lubitsch, West Hollywood and at Warszawa Restaurant, Santa Monica. The Polish Poster Festival LA was organized by Contemporary Posters, New York (www.contemporaryposters.com) a company specializing in the art of the Polish School of Posters. All posters are original, limited editions, priced from $135 and linen-backed (as are all fine antique vintage posters). The Polish-American artist Leonard Konopelski, a professor at the Pasadena Art Center College of Design, created the announcement poster in the tradition of the Polish School of Posters. Both the Consulate General of the Republic of Poland Los Angeles and the Polish Cultural Institute, NY have given their support to the Festival. Receptions will be held at the Track 16 Gallery on Saturday, February 17th, the Jazz Bakery on Saturday, March 10th and the University of Judaism on Sunday, March 11th. By the end of World War II, fences became the substitute for absent art galleries in Poland, so posters became the art of the street. Their provocative, camouflaged messages married the serious ambitions of painting with the easily grasped metaphor of posters. Poster art became a cultural phenomenon in itself heralding such diverse media as film, theatre, exhibits, jazz, CYRK, festivals, operas, musicals and books. Posters became a national Polish tradition. Ironicallyor in a triumph of right over mightthe Communist regime encouraged and even hired these Jewish artists. Why would these Holocaust perpetrators support them? Most theorists propose that Jewish culture had been an inextricable, leading force of Polish culture for 800 years. As the posters' fame spread internationally, The Polish School of Posters was recognized as a national genius not seen since France's La Belle Epoque (1890s). Though printed on low-grade paper intended to only last a few months, their artistic reign spanned 30 years. These humble posters proclaimed the birth of the National Jewish Theatreand produced global icons like Fiddler on the Roof Posters announced the stories of Sholom Aleichem (called the Jewish Mark Twain), Pulitzer Prize-winner Issac Bashevis Singer, novelist Jerzy Kozinskiand even American films like The Diary of Anne Frank and Cabaret. The founders of the Polish School of Posters were Eryk Lipinski (1908-1991), Jozef Mroszczak (1910-1975), Henryk Tomaszewski (1914-2005) and Tadeusz Trepkowski (1914-1954). These artists established the Polish Poster School of Art's signature: a painter's palette, quick sketch style, and clever metaphors. It's known for unexpected juxtapositions, ancient Judaic symbolism, hidden political messages and irrepressible Jewish humor. 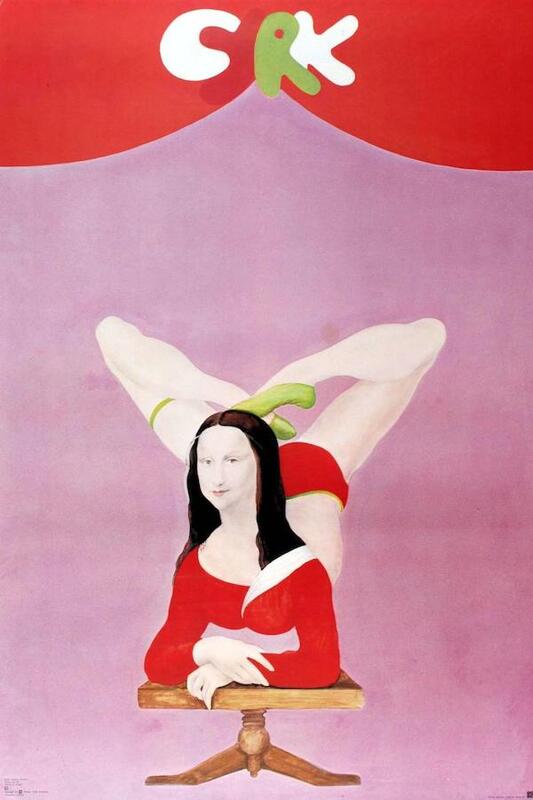 Of all the arts, the most highly recognized were circus posters. In twenty years of design supremacy, CYRK achieved an artistic quality and popularity not matched by any genre in the Polish School. The next wave continued the founders' traditions but with a more restrained intellectual style. These graphic artists (born in the 1920s and 1930s) include: Wiktor Gorka, Hubert Hilscher, Tadeusz Jodlowski, Jan Lenica, Marian Stachurski, Franciszek Starowieyski, Waldemar Swierzy, and Maciej Urbaniec. Under the Communists, all media were given an exalted status but were subject to almost complete censorship. Posters for theatre, opera, and musicals were commissioned as a propaganda tool and to promote cultural events. Poster design moved toward fine art posters, which were rich in Jewish themes. Posters were also commissioned to promote Poland's films. Andrzej Wajda, one of Poland's most eminent film directors, is widely recognized as an interpreter of his whole country's history. Foreign movies of Jewish importance were also produced and distributed worldwide. Witness America's The Diary of Anne Frank and Cabaret as well as the Eastern block's Of Men & Beasts and Shop on Main Street. After being banned in the 1940s, jazz music flourished as artistic freedom became more tolerated. As jazz' popularity rose, artists were commissioned to create posters for jazz performances and international jazz festivals. Note Waldemar Swierzy's Jazz Greats series featuring Jimi Hendrix in one of Hendrix's most famous posters. Born during and after World War II, they include: Mieczyslaw Gorowski, Lech Majewski, Rafal Olbinski, Andrzej Pagowski, Wiktor Sadowski, Jan Sawka, and Wieslaw Walkuski. Protest Art spoke surreptitiously with society, and firmly established the Polish School of Posters throughout the international art community. In the 1960s, Poland wrestled relative political autonomy from the U.S.S.R. and poster design became a well-recognized profession. Attracting artists from print, photography, illustration, sculpture, and painting it raised the bar on poster making. In the 1970s political turmoil further slashed governmental restraints. In an atmosphere of greater artistic freedom, poster design became more intellectually challenging as artists smuggled more of their own ideas into their work. In 1989 a new free market economy swept through Poland. Advertising began replacing posters as art. The trademark originality of Polish posters began to disappear. The fall of Communism also felled the golden age of Polish Posters. Yet democracy, of course, revitalized Jewish life. To this day, posters are one of the few sectors where imaginative, award-winning art is still created. This exhibition is made possible in part by the Taube Foundation for Jewish Life. Partial proceeds of all sales benefit the Jewish Community Center of San Francisco. More than 80 contemporary Jewish cultural posters of the world-famous Polish School of Posters will be on view at the JCC in Manhattan from November 16th - January 17th. It will bethe largest exhibit ever held in New York of original Jewish/Polish posters created by the world renowned artists of the golden age of Polish poster art (1950s-1980s; post WWII to the fall of Communism). The exhibit will feature Jewish themes posters commissioned by the government under Communism. 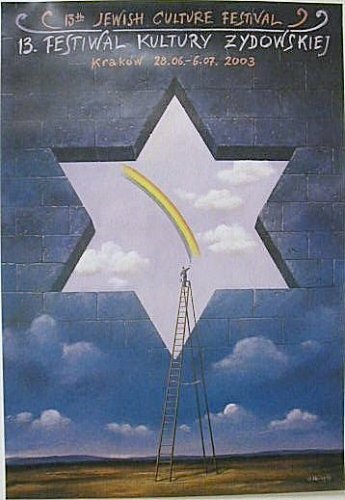 Although the once vibrant Jewish culture that had existed in Poland for more then 800 years had been effectively destroyed by the Holocause, the Soviet supported State employed Polish architects, designers & painters to create posters on various subjects including the celebration of Jewish culture. With the encouragement and support of the government, the Polish School of Posters achieved worldwide recognition as the best in contemporary poster art, possessing a genius comparable to France's La Belle Epoque of the 1890s. In addition to the graphic masterpieces designed during the Communist period such as Andrzej Pagowski's Austeria (film), Waldemar Swierzy's Moses (opera) and Marian Stachurski's Dybuk (theater), the exhibit will also include Jewish posters created since the introduction of a free market economy, and the concomitant revitalization of Jewish life in Poland. 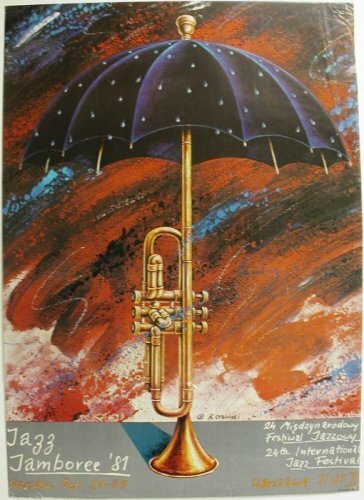 Supplementing the Jewish posters, there will be a sampling of some posters of the genre of the Polish School of Posters - jazz, film, opera, theater, political, CYRK, etc. 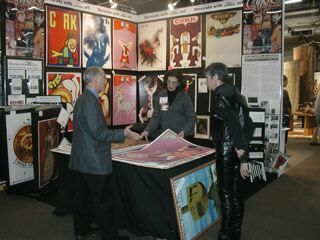 The exhibit was organized by Contemporary Posters, New York, NY, a company specializing in the art of the Polish School of Posters. The posters are all original, limited editions and priced from $135, linen-backed (as are all fine antique posters). A % of poster sales will be for the benefit of the JCC. All posters can be viewed at www.contemporaryposters.com. On Thursday, November 16th, 6-7 PM, there will be a gallery tour prior to an opening reception which will include a tasting of Polish vodkas. The Jewish Community Center in Manhattan is one of the most comprehensive community centers in New York with its programs to educate, inspire and transform. For more information visit www.jccmanhattan.org. 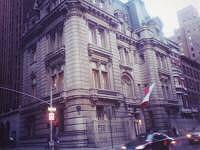 The exhibit at the JCC's Laurie M. Tisch Gallery, the Samuel Priest Rose Building, 334 Amsterdam Ave. at 76th Street. Admission is free and open to the public. Events arranged by the Polish Cultural Institute, NY, include screening the film Korczak, November 27th, 2:30 PM and performances by the Wroclaw Puppet Theater, Poland, of The Last Escape, based on the writings of Bruno Schultz, November 18th 8 PM & November 19th, 3 PM. Jazz posters of the world-famous Polish School of Posters will be on view at Jazz at Lincoln Center from October 30thNovember 27th. It will be Jazz at Lincoln Center's first full-scale exhibit of original jazz posters from the golden age of Polish poster art (1950s-1980s; post-World War II to the fall of Communism). More than twenty jazz posters by the renowned artists of the Polish School of Posters including Rafal Olbinski, Jan Sawka & Waldemar Swierzy will be on view. Some posters, notably Olbinski's Jazz Jamboree '80 and Sawka's Jazz of the Odra' 76 announce popular Polish jazz festivals; while others, principally Swierzy's Jazz Greats series, celebrate American jazz musicians many of whom are inductees of the Ertegun Jazz Hall of Fame at Jazz at Lincoln Center - John Coltrane, Duke Ellington, Miles Davis, et. al. The posters date primarily from the 1970s & 1980s, a period of relative artistic freedom in Poland during the Soviet era. 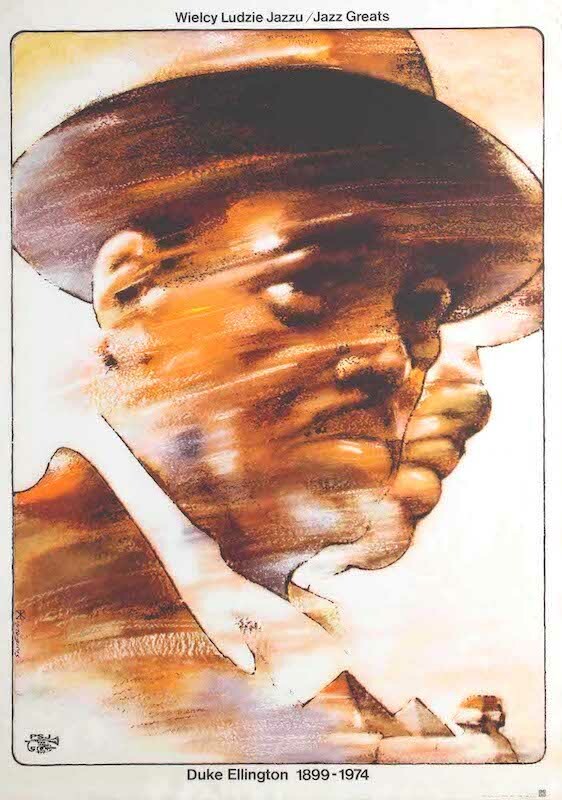 Under the Communist regime, Polish architects, designers & painters were employed by the State to create posters on various subjects including jazz. Encouraged and supported by the State, these artists became recognized as the best in contemporary poster art, possessing a genius comparable to France's La Belle poque of the 1890s. 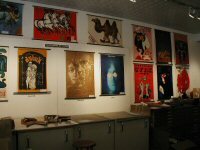 The current exhibit was organized by Contemporary Posters, New York, NY, a company specializing in the art of the Polish School of Posters. The posters are all original, limited editions, priced from $135 and are linen-backed, (as are all fine antique vintage posters). 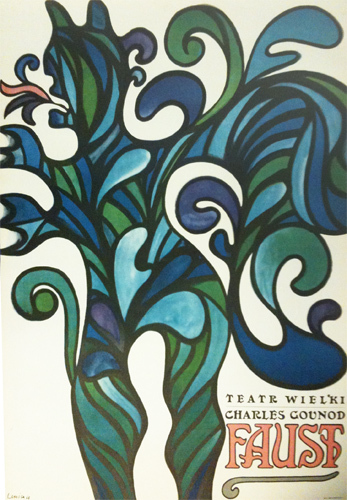 In addition to jazz, Contemporary Posters also offers theater, opera, Jewish, film & CYRK posters from the Polish School. These can be viewed at http://www.contemporaryposters.com/. 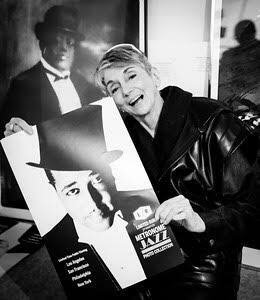 The exhibit is at the Peter J. Menschel Arcade of Jazz at Lincoln Center, 6th floor, Frederick P. Rose Hall, Broadway at 60th Street. It will be open for viewing during all Jazz at Lincoln Center concerts as well as Tuesday through Sunday, from 10am to 4pm. On Friday, November 17th, 6-7pm, there will be a gallery tour prior to the evening's concerts. The performances will include Paquito D'Rivera in The Allen Room at 7:30 & 9:30pm and the music of George Gershwin in Rose Theater featuring the Jazz at Lincoln Center Orchestra with Wynton Marsalis & special guests Marcus Roberts; the American Composer's Orchestra conducted by Steven Sloane; and Derek Bermel. Art is the perfect gift for Mother's Day, May 8th. And with 100% of the net proceeds of all sales of the poster Woman On Square Unicycle as well as 20% of all 'women' poster sales donated to the Ovarian Cancer Research Fund (OCRF), your gift will benefit women everywhere. 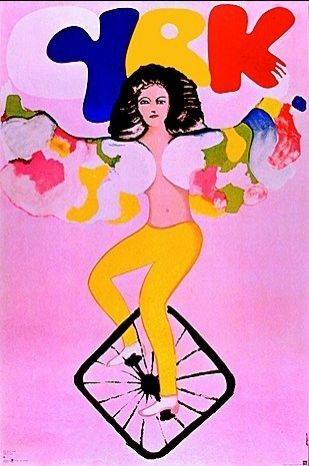 Woman On Square Unicycle is an original 1970s CYRK vintage poster from the world-renowned Polish School of Posters, acclaimed as the best in contemporary poster art, comparable to the genius of France's La Belle poque of the 1890s. 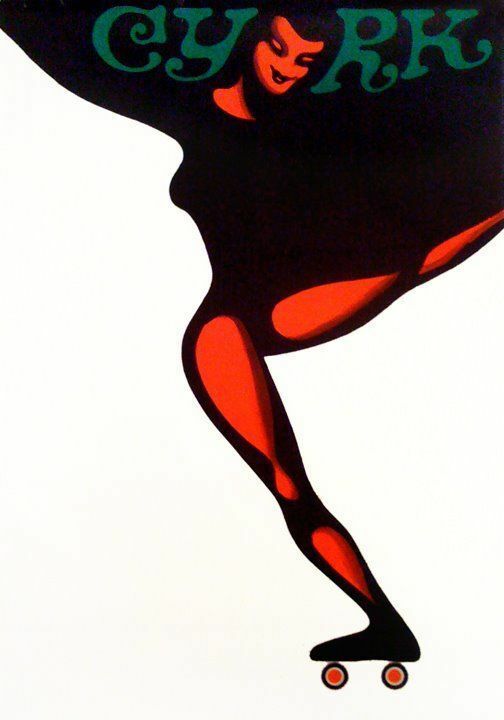 It was re-named 'OCRF Woman' by Contemporary Posters, a New York art poster dealer in 2002. The poster's coloring & imagery, not only artistically suggests OCRF, but also represents OCRF's mission - the unicyclist calling out to the viewer to share her ability to master the intimidating (successfully riding a square unicycle) & conquer ovarian cancer. Maciej Urbaniec (1925-2004) is an award-winning artist of the Polish School of Posters whose ingenious style conveys simple and powerful messages. His posters are in collections throughout the world including the Museum of Modern Art in New York City. Contemporary Posters is currently featuring Woman on the Square Unicycle as poster of the month on its website: www.contemporaryposters.com. The poster is an original, limited edition poster measuring 26" x 38"and is for sale at the special price of $150 including linen-backing [a $65 value]. In addition to CYRK woman posters, Contemporary Posters also offers over 100 other CYRK images as well as theater, opera, Jazz, Jewish, film, and exhibit posters from the Polish School of Posters. Ovarian Cancer Research Fund (OCRF) is a not-for-profit organization devoted to the conquest of ovarian cancer. To learn more about Ovarian Cancer Research Fund (OCRF)-visit their web site- www.ocrf.org. Famed Ray Charles art poster featured! At the 62nd annual Golden Globe Awards, Sunday, January 16th, Jamie Foxx received the prestigious Golden Globe award for his commanding portrayal of Ray Charles in the movie Ray. In his acceptance speech the actor paid homage to Ray Charles' positive philosophy by quoting: "Life is notes right underneath our fingers. All you've got to do is take the time to play the right notes...Ray, we are playing beautiful music today." Ray Charles, the jazz musician, soul singer and R&B legend who became a national and international celebrity died in 2004. 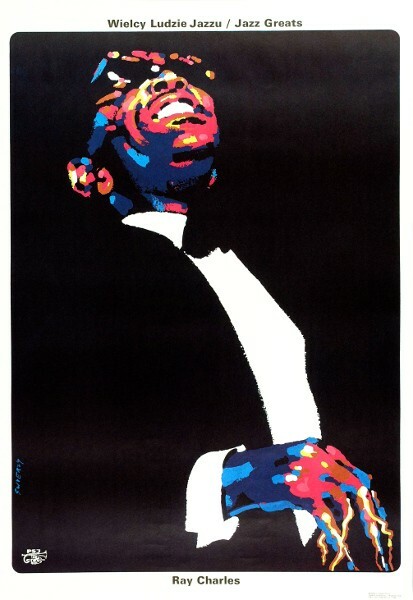 In recognition of Jamie Foxx's award and the numerous other nominations & awards for the movie Ray and its star actor, Contemporary Posters is featuring the art poster of Ray Charles by Waldemar Swierzy (b. 1931), one of Poland's most prominent posterists. 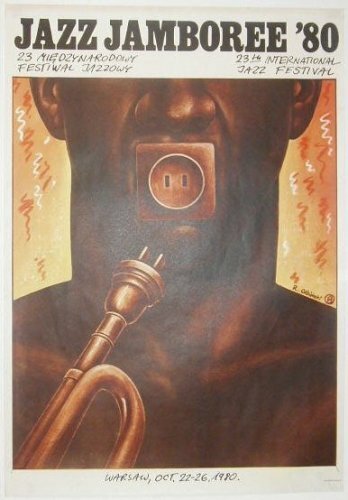 Under Communism, Polish artists were employed by the State to create posters on various subjects including jazz. 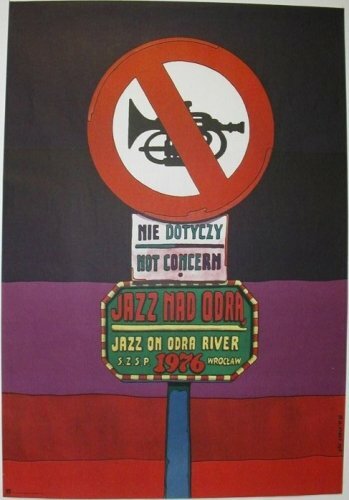 During the 1970s when jazz in Poland became more accepted and encouraged, artists were engaged to create posters to promote jazz events as well as to celebrate jazz musiciams. At this time, Waldemar Swierzy began designing the eleven posters honoring American Jazz Greats: Louis Armstrong, Count Basie, John Coltrane, Miles Davis, Duke Ellington, Jimi Hendrix, Billie Holiday, Charles Mingus, Thelonious Monk, Wes Montgomery & Charlie Parker. Jazz posters along with the other posters created in Poland during the communist era became known as the Polish School of Posters and are acclaimed as the best in contemporary poster art, comparable to France's La Belle poque of the 1890s. Contemporary Posters, a NYC company specializing in the art of the Polish School of Posters, is featuring the Ray Charles poster on its website: www.contemporaryposters.com. The poster is an original, limited edition posters printed in Poland in 1990 measuring 26" x 38". In addition to jazz, Contemporary Posters also offers theater, opera, Jewish, film, exhibit, and CYRK posters from the Polish School of Posters. Jazz posters of the world-famous Polish School of Posters are on view at The Jazz Gallery, beginning Sunday, September 26th, 2004. It is the first full-scale exhibition in New York City of original jazz posters from the golden age of Polish poster art, post-World War II through the fall of Communism, 1989. On display are 40 jazz posters by award-winning artists including Rafal Olbinski, Jan Sawka & Waldemar Swierzy. 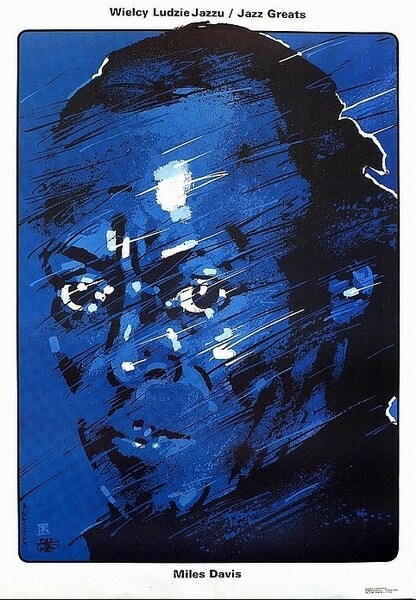 Some posters, notably Olbinski's Jazz Jamboree '80, announce jazz festivals, while others, principally Swierzy's Jazz Greats series, celebrate jazz musicians - Ray Charles, Miles Davis, etc. Most of the posters were designed in the 1970s-80s, at times of relative artistic freedom in Poland. 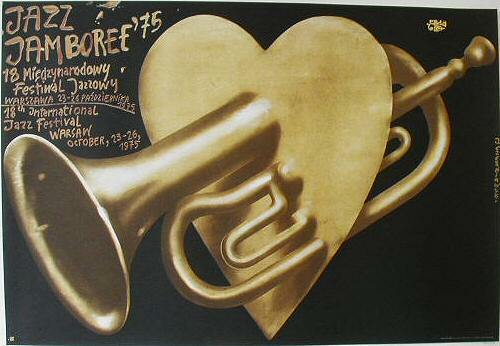 Under Communism, Polish artists were employed by the State to create posters on various subjects, including jazz. With the support of the Government, the Polish School of Posters became accepted as the best in contemporary poster art, comparable to France's La Belle poque of the 1890s. The Jazz Gallery is an international jazz cultural center, recognized as both a top-rated performance space (considered by the New York Times to be "the most imaginatively booked jazz club in New York City") and a unique exhibition space. The Smithsonian's Seeing Jazz show was presented here. 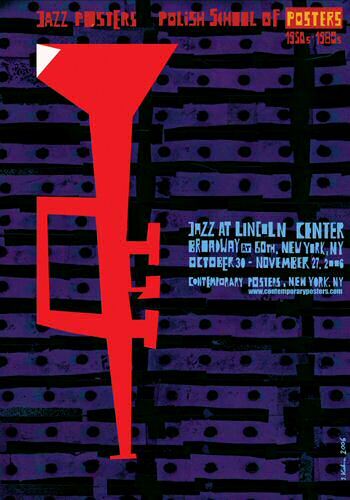 Contemporary Posters, a NYC company specializing in the art of the Polish School of Posters, and The Jazz Gallery organized the current exhibition. The posters are original, limited editions and priced from $125, linen-backed. In addition to jazz, Contemporary Posters also offers theater, opera, Jewish, film and CYRK posters from the Polish School of Posters. These can be viewed at www.contemporaryposters.com. Leszek Mozdzer is one of Poland's most popular jazz pianists, acclaimed for his imporovisation and style. His performance, following the art opening, will be his only New York solo concert this season. The jazz poster art opening is free and open to the public. Admission to the piano concert by Leszek Mozdzer is $15; reservations are recommended. In the movie, The Terminal, Tom Hanks plays an Eastern European tourist who at the conclusion visits a New York jazz club to secure a musician's autograph - the original objective of his sojourn. The wall decor chosen for this quintessential New York jazz scene were two Rafal Olbinski's jazz posters. Rafal Olbinski (b.1945) was already a prominent posterist in Poland before 1982 when he emigrated to the U.S. In New York City, his provocative style, encompassing a fascinating mix of fact and fantasy, swiftly achieved artistic acclaim. A recipient of over 100 awards, his art is in private and public international collections and has appeared frequently on the cover of Newsweek, Business Week and in the New York Times as well as in posters for the New York, Cincinnati & Philadelphia opera companies. Since 1985 he has been teaching at the School of Visual Arts in New York. Olbinski was one of over 50 artists employed by the Polish government during the Communist era [post WWII-1989], to create posters on various subjects including jazz. These brilliant posters, which became known as the Polish School of Posters, have been likened to those of France's La Belle epoque of the 1890s and are acclaimed as the best in contemporary poster art. 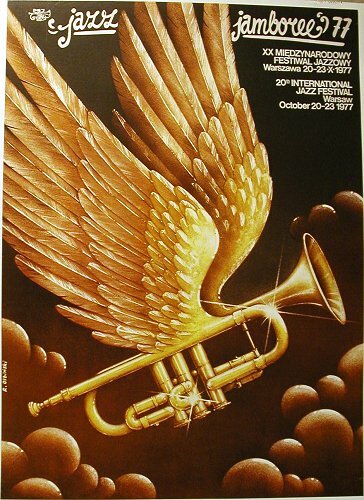 Contemporary Posters, a New York City company, specializing in the art of the Polish School of Posters is featuring Olbinski's Jazz Jamboree '81 on its website: www.contemporaryposters.com as well as a selection of other Olbinski jazz and other posters. Jazz Jamboree '81 is an original, limited edition poster measuring 26" x 38"and is for sale at the price of $225 including linen-backing [a $65 value]. In addition to jazz, Contemporary Posters also offers theater, opera, Jewish, film, exhibit and CYRK posters from the Polish School of Posters. Posters of the world-famous Polish School of Posters are on view at the Balcony Gallery, Merkin Concert Hall at Kaufman Center From October 25th through the end of the year. The exhibition features original posters from the golden age of Polish poster art, post-World War II through the fall of Communism, 1989. On display are more than 25 film, jazz, theater & CYRK posters by award-winning artists. Some posters, such as J. Lenica's 'Faust' & F. Starowieyski's 'A Woman is a Woman' promote a specific play/film; while others, principally W. Swierzy's 'Jazz Greats', celebrate a genre - jazz musicians: Ray Charles, Duke Ellington, etc. The posters augment the Reel Music and NO MINIMUM Jazz duo-piano concerts taking place at Merkin Concert Hall. The November 18th reception, 5:30-7:00PM, will offer Polish vodka & pickles. Additional rare posters of the Polish School will be available for sale with a percent of the proceeds to benefit the Kaufman Center. Admission is free. Merkin Concert Hall is one of New York's finest intimate concert spaces whose adventurous programming has won many coveted awards. The Reel Music Film & Live Music series presents: on November 18th, six short silent films from 1911-25 by the Russian filmmaker Ladislaw Starewicz with music by the Tin Hat Trio & on December 11th, the 1926 silent film 'Faust' by F.W. Murnau with music by Phillip Johnston. Both performances are at 8PM. Contemporary Posters, a NYC company specializing in the art of the Polish School of Posters, organized the current poster exhibition. The posters are original, limited editions and priced from $125, linen-backed. The images were created during the Polish Communist era by artists employed by the State to design posters on various subjects. With the support and encouragement of the Government, the Polish School of Posters became accepted as the best in contemporary poster art, comparable to the genius of France's La Belle epoque of the 1890s. Posters of the Polish School of Posters can be viewed 24/7 at www.contemporaryposters.com. CYRK & other Polish School of Posters will be on view at New York's Gallery of Graphic Arts during August & September. It will be the gallery's first full-scale exhibit of posters from the world-famous Polish School of Posters [post World War II (1945) until the fall of Communism (1989)]. Encouraged and supported by Poland's communist government, the Polish School of Posters became a national treasure that set the standards others follow and became recognized as the best in contemporary poster art - comparable to France's La Belle epoque of the 1890s. More than 75 Polish artists were employed by the State to create posters on specified themes: theater, Jewish, exhibits etc. in addition to CYRK, the quintessential posters of the Polish School. On display will be more than 30 CYRK posters as well as a small sampling of Jazz, Jewish, Opera and Theater posters. The Gallery of Graphic Arts, an established Upper Eastside gallery and frame shop, features presentations of new and different contemporary art. The current exhibit was organized by Contemporary Posters, a New York City company specializing in the art of the Polish School of Posters. All posters are original, approximately 27"w x 39"h, and affordably priced from $125 to $525. All are in excellent condition, were printed in Poland from 1965-1989 in limited quantities by agencies of the government and are linen-backed (as are all fine antique vintage posters). Jewish posters are one of the genre of posters created by artists of the renowned Polish School of Posters (1950-89) - recognized as the best in contemporary poster art, comparable to La Belle epoque posters of the 1890s. The Jewish posters were designed during the communist era to promote the Jewish theater, opera, film & exhibitions. They are original vintage posters, linen-backed, approx. 27"w x 39"h and priced from $125. opening reception: 23 January 7:30 - 9:00p.m. East European Prints and Posters offers a look into the artistic production in this part of the world that has not readily been available. It will feature a selection of 25 colorful "CYRK" Circus Posters created before and 16 black-and-white etchings made before and after the collapse of Communism in 1989. The post-1989 etchings were collected by Charles E. Merrill, Jr. and donated to Moravian College in 1988. Himself an artist, Mr. Merrill has long championed the arts and culture of Eastern Europe, (Two of his own works will be exhibited along with this collection of prints.) His donation offers an intense, personal vision of artistic life and truth being created in Eastern Europe today. Now that the censors are off, this vision is very different from the official one that was once sponsored by the state. During the Communist era, all posters had to be approved by an agency of the Communist Party. Artists got their messages across to the public by creating images with hidden meanings. The 25 original posters, on display in the U.S. for the first time, include many hard-to-find images and 5 "censored" posters. This exhibition of prints is part of Payne Gallery's ongoing program of exhibitions that focus on artistic media and that support the offerings of the Art Department of Moravian College. Printmaking is the most democratic of media because the printed image is reproducible and circulated, sometimes widely (such as the CYRK Posters) and sometimes in small editions (such as the etchings in the Merrill donation). Either way, the opportunity for communication is fundamentally different from the unique statement that artists make in painting, This exhibition affords our students and the viewing public the advantage of seeing both artistic skills and artful communication strategies at the same time. PAYNE GALLERY of Moravian College is located in the Priscilla Payne Hurd Campus of Moravian College, between Church and Main Streets in Bethlehem, Pennsylvania, Gallery hours are Tuesday through Saturday from 11 am to 4pm; and from 6pm to 8pm Tuesday through Thursday. PAYNE GALLERY is open 11:00 am to 4:00 pm Tuesday through Sunday, and 6:30 to 8:30 pm Tuesday, Wednesday and Thursday evenings. It is closed Mondays, major holidays and during school breaks. Admission is free and free parking is available. THE PRISCILLA PAYNE HURD CENTER FOR MUSIC AND ART, with Payne Gallery and Foy Concert Hall, is located on the Priscilla Payne Hurd Campus of Moravian College in Historic Bethlehem, Pennsylvania. MORAVIAN COLLEGE is in Bethlehem, Pennsylvania, sixty miles 'north of Philadelphia and ninety miles west of New York City. MAILING ADDRESS: 1200 MAIN STREET, BETHLEHEM, PA 18018-6650 . Rabbi David H. Lincoln of Park Avenue Synagogue and Rabbi Peter J. Rubinstein of Central Synagogue each received a Jewish/Polish poster featured at an exhibit held at the Consulate General of the Republic of Poland, NYC. The synagogues were among several prominent Jewish organizations that hosted a private viewing at the Polish Consulate exhibit of Jewish/Polish posters included in a collection of 100+ contemporary art posters from the world famous Polish School of Posters [post World War II (1945) until the fall of Communism (1989)]. The exhibit served both to introduce New Yorkers to the beauty of the Polish School of Posters recognized as the best in contemporary poster art, comparable to the La Belle epoque 1890s French posters & to encourage interaction as well as better relations between the Jewish community and Poland. 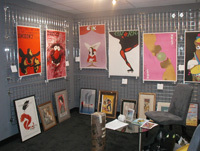 Contemporary Posters, a NYC poster dealer, organized and curated the exhibit. 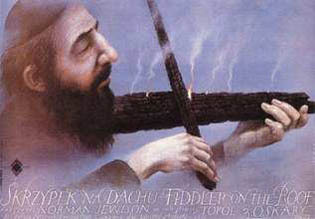 It was the expressed desire of the Central Synagogue congregation to have the Fiddler on the Roof poster for their synagogue's art collection. The photo shows Ylain G. Mayer of Contemporary Posters presenting the poster to Rabbi Rubenstein as Steven Portnoy, Brotherhood President & Janet Stovin, Sisterhood President look on. Donald S. Mayer of Contemporary Posters presents The Stormy Life of Lasik Roitschwantz to Rabbi Lincoln. The poster, a dramatization of the famous Ilya Ehrenburg novel, appealed to the Rabbi's interest in European history. Both posters were designed for the E.R. Kaminski, National Jewish Theater, Warsaw, Poland by Andrzej Pagowski, a foremost artist of the Polish School of Posters. More Jewish/Polish posters, as well as many other contemporary posters displayed at the Polish Consulate exhibit, can be viewed 24/7 at www.contemporaryposters.com. The Consulate General of the Republic of Poland, 233 Madison Ave. (E. 37th St.), NYC, will be the site of an exhibit of the world-renowned Polish School of Posters from December 2nd to 16th. The public is invited to attend Wednesdays-Dec 4th & 11th, from 12:00 - 5:30 PM. Over 100 contemporary posters from the golden era of the Polish School of Posters [post WWII (1945) until the fall of Communism (1989)] will feature Jewish/Polish cultural posters. In addition to Jewish exhibit, festival, film and theater posters, the exhibit will also include examples of other contemporary Polish posters including CYRK posters, the quintessential posters of the Polish School of Posters - recognized as the best in contemporary poster art, comparable to La Belle Epoque French posters. In keeping with the exhibit's goal of encouraging greater interaction between the Jewish community and Poland, there will also be a Taste of Poland - complimentary samplings of imported Polish food and drinks, and The Sound of Poland - music of the famous Cracow Klezmer Band (direct from Poland), plus information about the Jewish Culture Festival(Krakow), National Jewish Theater (Warsaw) & Museum of the History of Polish Jews Warsaw with a percentage of poster sales donated to the museum. Several prominent Jewish organizations - American Society of Jewish Heritage in Poland, Central Synagogue, Congregation Rodeph Sholom, Friends of the Jewish Culture Festival Society, Park Avenue Synagogue & the Simon Wiesenthal Center will host a private viewing. All the posters are original art posters and are affordably priced. The exhibit is presented by Contemporary Posters. The posters can be previewed 24/7 at www.contemporaryposters.com. 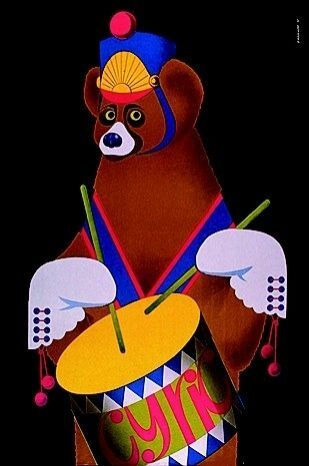 Contemporary Posters (www.contemporaryposters.com), the premier website for CYRK... original 1960s-1970s Polish art/circus posters, will offer free shipping through August 31st to celebrate the introduction of its recently enhanced website. Changes in the website include: (1) a new search feature for the gallery of 100+ CYRK... Polish art/circus posters. 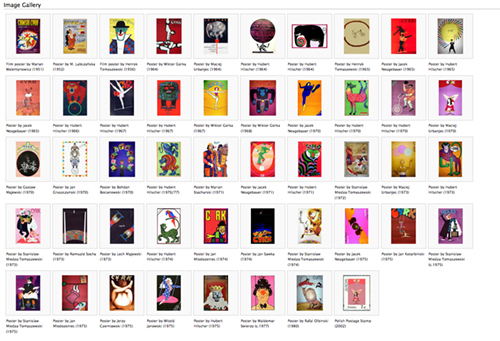 CYRK posters can now be viewed by category: subject, gift, style, price, color & artist. (2) new features explain the hidden meanings in many CYRK posters, show photos of examples of Decorating with CYRK art for any room in the home or office... for kids & for teens and offer attractive framing for any poster. And (3) new galleries of Polish Exhibit, Film, Jazz, Jewish, Opera & Theater posters by the artists who designed CYRK posters. The new poster galleries illustrate the diversity & genius of these artists of the Polish School of Posters who have been likened to the French La Belle epoque artists of the 1890s. The enhanced website is more informative, easier to navigate and offers a wider variety of poster art. The beauty & enchantment of the colorful CYRK posters - the most highly acclaimed posters of the world famous Polish School of Posters (post World War II-1945 until the fall of Communism-1989) are recognized as the best in contemporary poster art. All posters are original (no reproductions), in mint condition. All CYRK posters are linen-backed as are all fine antique/vintage posters. Linen-backing prevents damage and keeps the poster in mint condition. CYRK posters are priced from $125 to $850. Contemporary Posters' booth at the New York Home Design Show, November 1-3, will present ideas on how to decorate with CYRK art. 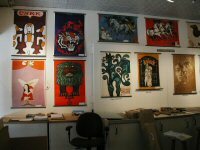 More than 100 original CYRK... Polish art/circus posters will be displayed. Also, on view will be photos of CYRK posters in various settings in the home & office as well as recommendations of posters for specific rooms e.g. kids', teens', NY sophisticated black, LA sunny red. Decorating with art is a well-recognized way of creating unique and attractive surroundings. CYRK posters, with their compelling graphic images and wide range of styles, subjects, messages & coloring lend themselves to most locations. Styles range from real to surreal to ideal, subjects from faces to felines to forms, coloring from pale to presumptuous to psychedelic and messages from clear to concealed to cryptic. CYRK posters are the quintessential posters of the world-famous Polish School of Posters (post World War II-fall of Communism). The Polish School of Posters, recognized as the best in contemporary poster art, was encouraged and supported by the government under Communism. It became a national treasure that set the standards others follow and possessed a genius not seen in one country, at one time, since France's La Belle epoque of the 1890s. 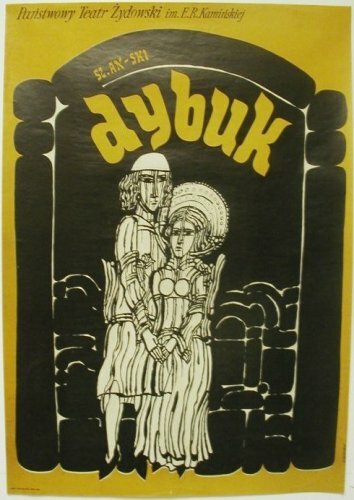 More than 75 Polish artists were employed by the State to create posters on specified themes: film, jazz, art, travel, opera & theater in addition to CYRK. Original CYRK posters are approximately 27"w x 39"h, and affordably priced from $125 to $850. All are in mint condition, linen-backed (as are all fine posters) and had been printed in Poland from 1965-1989 in limited quantities. CYRK posters can currently be seen 24/7 at www.contemporaryposters.com and will be exhibited at the Contemporary Posters' booth #158, the Architectural Digest/Home Design Show, "a show of great design", Jacob Javits Center, NYC, Thurs & Fri 10-8, Sat 10-7. Contemporary Polish Posters at October Poster Fair! 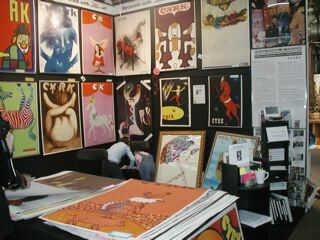 The Contemporary Posters' booth at the New York International Vintage Poster Fair, October 26-28, will be previewing a poster exhibit to be held at the Consulate General of the Republic of Poland (NYC), April 2002 - the time of the 59th anniversary of the Warsaw Ghetto uprising. Original posters from the world-famous Polish School of Posters (post World War II-fall of Communism) will be shown. 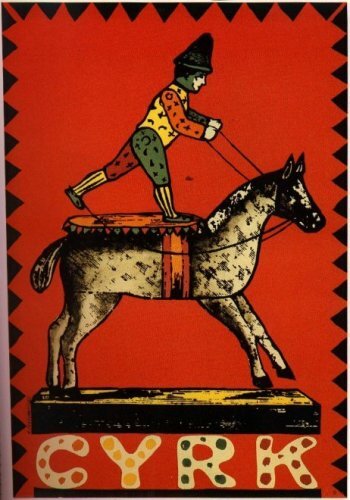 Featured will be the posters of Polish Jewish culture & CYRK...Polish art/circus posters. At the fall Poster Fair, Contemporary Posters will display more than 100 different images of Jewish culture & CYRK posters -- the quintessential posters of the Polish School of Posters. 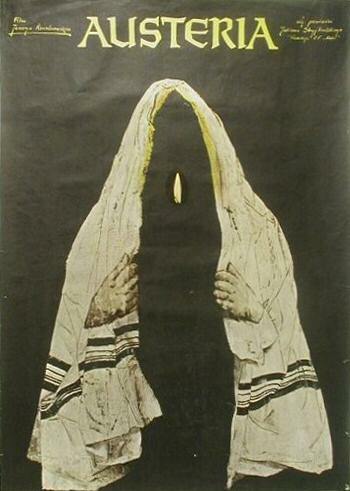 Jewish culture posters include a variety of topics: Warsaw Jewish Theater (e.g. Death of a Salesman, The Dybbuk), Warsaw Ghetto Uprising, international films (e.g. Europa Europa, Fiddler on the Roof), Krakow Jewish Culture Festival, etc. 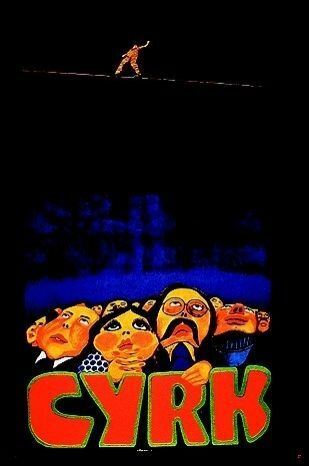 CYRK posters also encompass a wide range of subjects- from faces to forms, as well as styles- from real to surreal, coloring- from psychedelic to pale and messages- from obvious to obscure. The Polish School of Posters, encouraged and supported by the government under Communism, became a national treasure that set the standards others follow and possessed a genius not seen in one country, at one time since France's 'La Belle epoque' of the 1890s. More than 75 Polish artists were employed by the State to create posters on specified themes: film, jazz, opera & theater in addition to Jewish culture & CYRK. 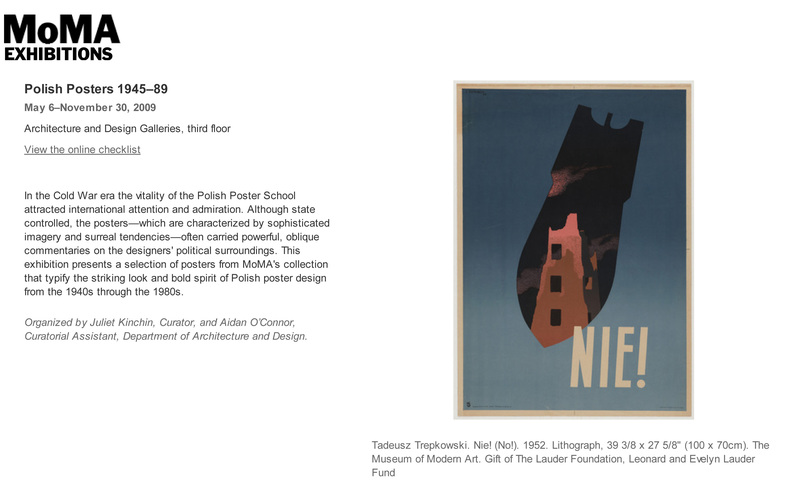 Original contemporary Polish posters are 27" x 39", linen-backed and affordably priced from $125 to $850. CYRK posters can currently be seen 24/7 at www.contemporaryposters.com. 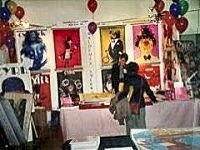 The Poster Fair (IVPF) will be held at the Metropolitan Pavilion, 125 West 18 St, NYC; October 26 -28, Fri.5-9, Sat.10-7, Sun.11-6. FREE! Solidarity poster @ contemporaryposters.com! Contemporary Posters is offering a FREE Solidarity (SOLIDARNOSC) poster in celebration of the 20th Anniversary of Polands Solidarity (1980-2000). The artist's special edition Solidarity poster will be sent FREE with every order of CYRK original Polish art/circus posters from www.contemporaryposters.com. The Solidarity (SOLIDARNOSC) poster is the world-famous poster that helped the Polish people win their freedom - the poster that served as the visual rallying symbol for the defeat of Communism. 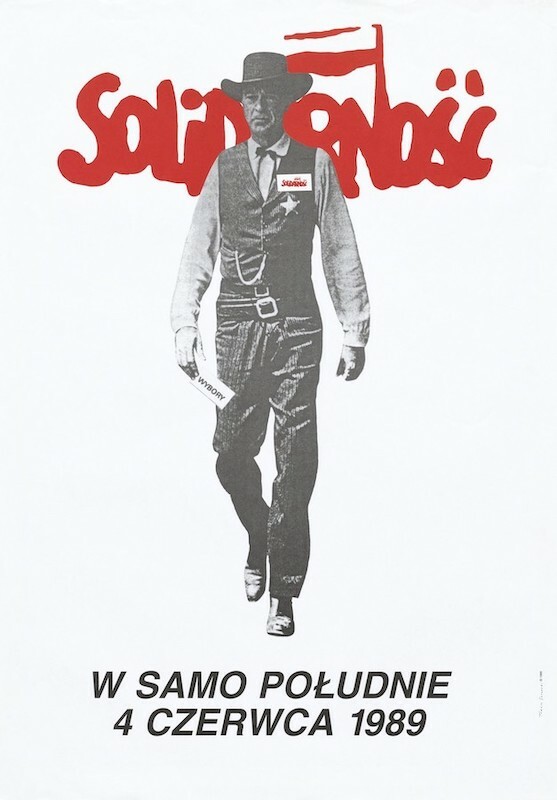 The artist, Tomasz Sarnecki, a 23 year old Polish graphic designer, transformed a publicity still for the film High Noon (1952) into a campaign poster for the crucial 1989 Polish elections which brought Lech Walesa and the Solidarity party to power. 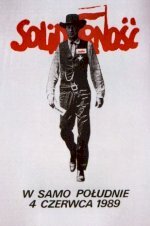 Gary Cooper is shown carrying a ballot and wearing the Solidarity logo - SOLIDARNOSC. The message at the bottom is short and to the point: W Samo Poludnie, 4 Czerwca 1989 - It's High Noon, June 4, 1989. Sarnecki reprinted in Poland a limited quantity of his Solidarity poster (signed in the plate) to honor the 20th Anniversary of Solidarity in 2000. In 1980, after a rash of nationwide strikes, Solidarity gained recognition as the first legal independent trade union in a Soviet controlled country since 1946. 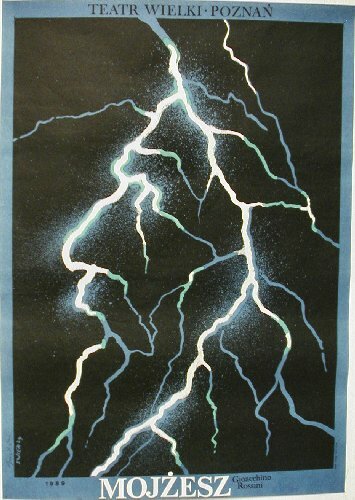 CYRK posters are the most highly acclaimed and recognized posters of the renowned Polish School of Posters (1945-89). The Polish government under Communism had encouraged and supported poster art, issuing more than 200 different CYRK posters by more than 75 artists. As a result, the Polish School of Posters became extraordinary, possessing a genius not seen in one country since Frances La Belle epoque of the 1890s. 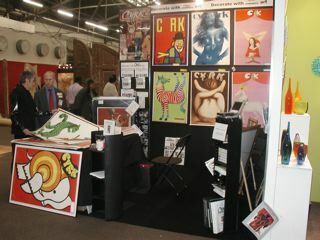 More than 100 different CYRK poster designs can be viewed by clicking on www.contemporaryposters.com. 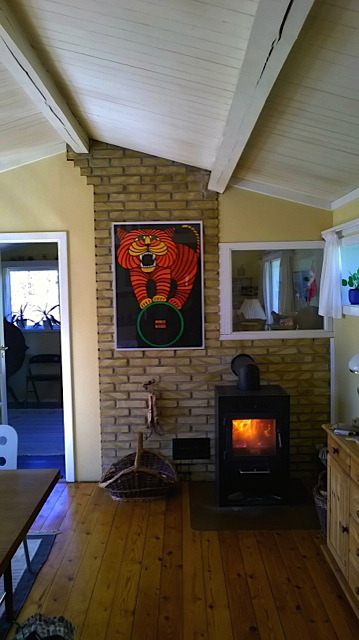 Original 1970s CYRK posters are available for sale from $125 to $375 linen-backed. The Solidarity. (SOLIDARNOSC) poster (27 1/2w x 39 1/2h) is FREE, while supply lasts, with every CYRK poster order. Contemporary Posters was formed to introduce establish graphic design posters as an art form in the U.S. In other countries, they long have been recognized and collected as art. Contemporary graphic design posters - the antique/vintage posters of tomorrow...the art investment for the future! April - 2nd National Congress of Delegates of NSZZ Solidarity reelects Lech Walesa president. 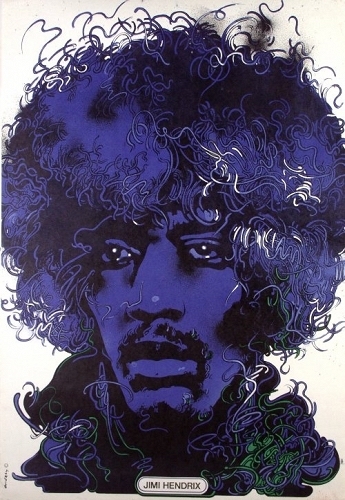 At the Swann Galleries Inc., NYC, poster auction, August 2, 2000; two rare 1970's CYRK...Polish art/circus posters fetched record high prices. After some lively bidding, Elvis hound dog (1970) by Jerzy Treutler and Gal roller skating (c.1972) by Anna Kozniewska, were gaveled down at $600 and $550 respectively. CYRK posters are the most highly-acclaimed and recognized posters of the world-famous Polish School of Posters (post World War II-the fall of Communism). The Polish School of Posters changed the face of contemporary poster design forever and set the standards others follow. It possessed a genius not seen in one country since France's 'La Belle epoque' of the 1890s. The prices realized at the Swann auction confirmed the continuing popularity and up trend in the poster market, especially in contemporary posters. Contemporary posters are usually defined as posters created since 1950 and have long been recognized and collected as art in Europe and Asia. CYRK posters, though now showing percentage price increases of approximately 2000% over the last 20 years, are still a very affordable and aesthetically pleasurable way to invest in the art market. Contemporary Posters of NYC has a large collection of CYRK posters by more than 35 different artists available for sale and can be viewed on www.contemporaryposters.com. All posters are original, linen-backed, 27"w x 39"h and priced mainly from $125 to $375. Contemporary Posters will be exhibiting at the International Vintage Poster Fair, Metropolitan Pavilion, 125 West 18th St, NYC, October 20th to 22nd. The Swann Galleries' auction also witnessed increased interest and strong prices in other contemporary posters as well as vintage posters by such well-recognized artists as Bonnard, Toulouse-Lautrec and Mucha. A quartet of museum-quality, rare 1970s CYRK posters will be on auction for the first time at the Swann Galleries Inc. sale in New York City on August 2nd, 2000. Clown face with derby - the only CYRK poster to be made into a postage stamp - will be the featured CYRK poster. CYRK...original Polish art/circus posters are the most highly-acclaimed and recognized posters of the world-famous Polish School of Posters. The Polish School of Posters changed the face of contemporary poster design forever and set the standards others follow. It possessed a genius not seen in one country since Frances La Belle epoque of the 1890s. The Republic of Poland issued the Clown face with derby stamp (a 2500 zloty stamp) in 1992 as a tribute to the popularity of both the poster and the artist as well as CYRK (the Polish circus). 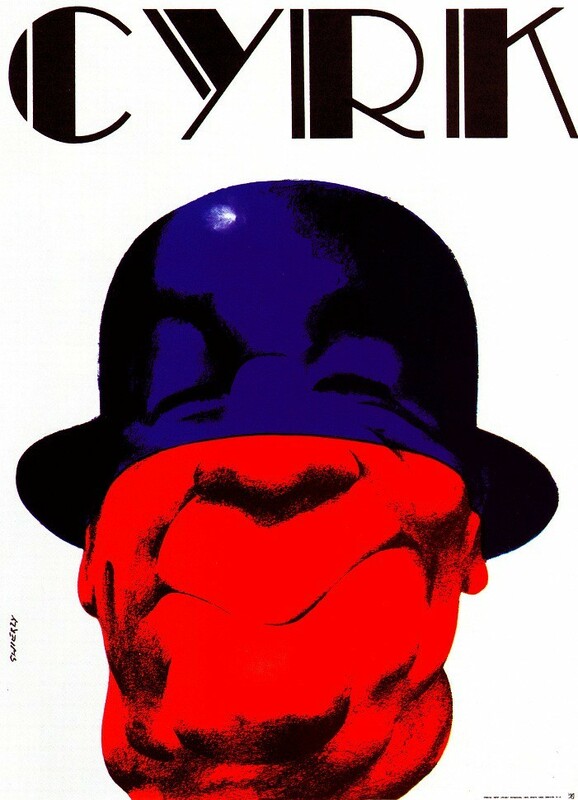 The Clown face with derby poster by Waldemar Swierzy is one of more than 200 different CYRK posters by more than 75 artists commissioned by the Polish government during the golden era of the Polish School of Posters (post-WWII  until the fall of Communism ). The artist, Waldemar Swierzy (b.1931), is one of Polands most prominent posterists. 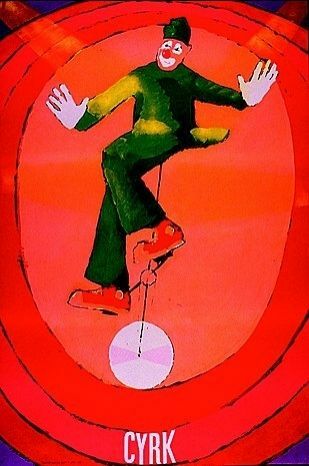 His varied style is innovative often employing unusual concepts - of which Clown face with derby (1970) is a prime example. 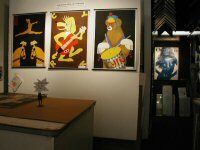 The other CYRK posters to be auctioned are: Elvis hound dog (1970) a paean to American culture by Jerzy Treutler, a significant 1960-70s CYRK artist; 3 bikers (1974) a colorful psychedelic image by Jan Sawka, currently a foremost Polish-American theater set designer and Gal roller skating (c.1972) a joyful exuberant poster by Anna Kozniewska, one of the few women CYRK artists. The mid-summer poster sale at the Swann Galleries, 105 E. 25th St., New York City, will also include vintage posters by such well-recognized artists as Bonnard, Toulouse-Lautrec and Mucha as well as other rare images. The 1st exhibit of CYRK...Polish circus posters in the Los Angeles area will be held at the same time as the Autry Museum of Western Heritage's exhibit - Western Amerykanski: Polish Poster Art & the Western. The Autry Museum's blockbuster show, Oct.16-Jan. 30, 2000, will include over 100 Polish posters of American Western films created during the golden age of the Polish School of Posters (c.1945-1989). 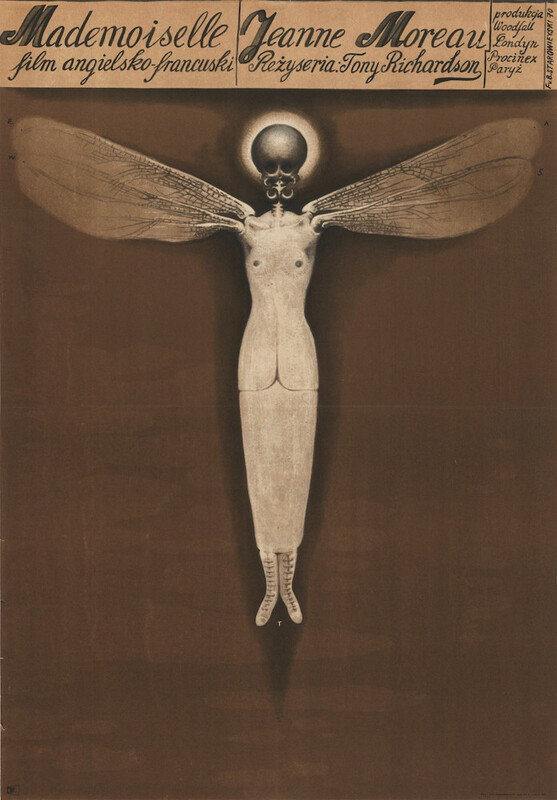 Supported and encouraged by the Polish government under Communism, posters of this period gained popularity and a reputation as the best in poster art. They changed contemporary poster design forever, setting the standards others follow. When they crossed the fine line between visual communication and art, they became a branch of contemporary art. The Jason Vass Gallery, 1210A Montana Ave., Santa Monica, will host the CYRK exhibit from Oct. 16-24. A selection of Polish film posters will also be displayed. The Opening Reception, offering a sampling of Polish food & drink by Santa Monica's Warszawa Restaurant and Polonia Imports, will be held on Saturday, Oct. 16th, 6-8:30PM. The Weidman Gallery & Custom Framing, 811 North La Cienega Blvd., Los Angeles will host the CYRK exhibit from Nov. 3-13. International vintage posters will also be on view. In addition, a selection of CYRK posters by Waldemar Swierzy, one of Poland's leading poster artists, will be featured at the Warszawa Restaurant, 1414 Lincoln Blvd., Santa Monica. All CYRK posters are original, linen-backed, 27"w x 39"h and will be available for sale from $125-$375. Contemporary Posters' mission is to establish graphic design posters as an art form in the U.S. In Europe and Asia, they have long been recognized, exhibited, bought and collected as art - contemporary graphic design posters are the vintage posters of tomorrow.... the art investment for the future! Waldemar Swierzy's award-winning 1970's CYRK... Polish circus posters are currently on view at Warszawa, a popular Los Angeles area restaurant. Waldemar Swierzy (b.1931) is one of the preeminent artists of the Polish School of Posters and its most prolific. He has created nearly 2,000 posters including over 20 CYRK designs, one of which was reproduced as a postage stamp by the Republic of Poland in 1992. In December, 1998 at the Consulate General of the Republic of Poland, New York City, Swierzy received an award for excellence in poster art. A member of the prestigious AGI (Alliance Graphique Internationale) since 1965, his oeuvre has enjoyed an international reputation for decades. CYRK posters, the quintessence of the Polish School of Posters, convey the art of painting with the succinctness of the poster. They are artistic in intent, emphasizing strong, bold expression in a restrained, intellectual manner and thus cannot be likened to their U.S. counterpart. Swierzy's posters are particularly striking and innovative, often employing unusual concepts to capture the viewer's attention. In a myriad of styles, his posters mirror Poland's post-World War II social history. The Polish School of Posters (c.1945-1989) possessed a genius not seen in one country since France's La Belle epoque of the 1890s. It was the Polish School of Posters that combined the best in poster and graphic art: changing contemporary graphic design forever and setting new standards for others to follow. This exhibit of Swierzy's CYRK posters will be on display at Warszawa on a rotating basis. Warszawa, an established, unpretentious restaurant specializing in Polish-American food at reasonable prices, exudes an old-world charm. It's open for dinner only & is located at 1414 Lincoln Blvd., Santa Monica. Contemporary Posters of New York City which offers more than 100 different CYRK poster designs by more than 35 different artists has organized the exhibit. The Swierzy posters, all linen-backed, are available for sale at Warszawa and range in price from $75 to $375. Contemporary Posters was formed to introduce & establish graphic design posters as an art form in the U.S. Contemporary graphic design posters...the art investment for the future! Rafal Olbinski, a celebrated Polish-American artist, will be making a guest appearance at the Contemporary Posters' CYRK... exhibit at The International Vintage Poster Fair, New York, April 16-18. 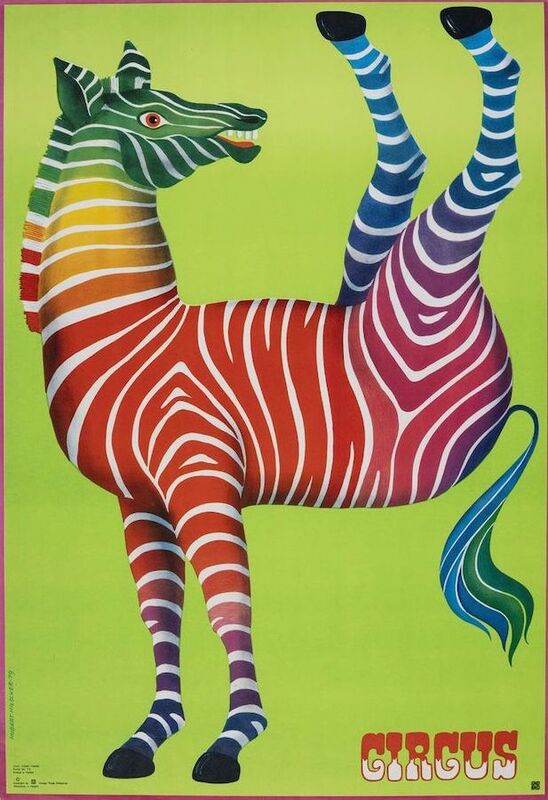 The exhibit will include more than 75 different images of original 1970s CYRK... Polish circus posters, the highly-acclaimed and recognized posters of the world-famous Polish School of Posters. Olbinski (b.1945) was already one of Poland's more prominent posterists before 1982 when he emigrated to the U.S. In New York City, his provocative surrealistic style swiftly achieved critical acclaim. His fascinating mix of fact and fantasy, often subtly, comments on society. A recipient of over 100 awards, his art is in private and public international collections. During his appearance Saturday, April 17th, 1-3PM, the artist will be autographing his CYRK posters as well as copies of his book Olbinski Posters. Waldemar Swierzy (b. 1931), one of Poland's most prominent posterists and a designer of nearly 2,000 posters, will be the subject of a limited retrospective of his CYRK posters. These posters employ unusual concepts in varied styles which frequently mirror Polish social history from 1960s through 1980s. A member of the prestigious AGI (Alliance Graphique International) since 1965, Swierzy was honored in December at a CYRK poster exhibit at the Polish Consulate in NYC for excellence in poster art. Swierzy's Clown face with derby (1970) - the only known circus poster to be made into a postage stamp - will be included in the exhibit. The Republic of Poland issued this stamp in 1992 as a tribute to the popularity of both the poster and the artist as well as CYRK, the Polish circus. The poster will be sold at silent auction; the last bid will be accepted Sunday, at 4:30PM. CYRK posters by more than 35 different artists also will be on view at the Contemporary Posters' booth. 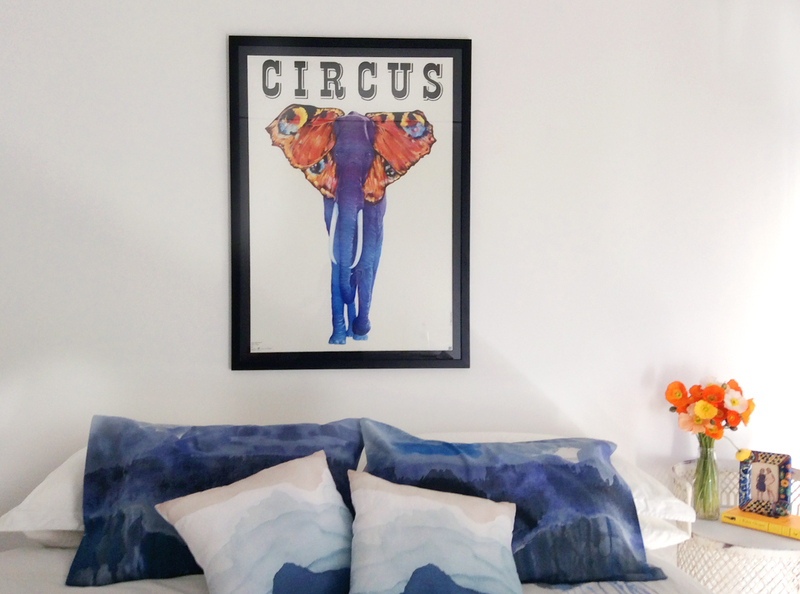 Like the circus they represent, CYRK posters are exciting and diverse in design. All posters are original, linen-backed, 27"w x 39"h and priced from $125 to $375. The renown Polish School of Posters (post-WWII until the fall of Communism in 1989) changed the face of contemporary poster design forever and set the standards others follow. When it crossed the fine line between visual communication and art, it became a branch of contemporary art. The 21st International Vintage Poster Fair will be held at the Metropolitan Pavilion, 110 West 19th St., April 16-18, NYC, Friday, 5-9PM, Saturday 10-7PM & Sunday 10-5PM. 35 exhibitors from Europe and the U.S. will participate. for info on IVPF: contact Louis Bixenman, Loupro, Ltd., (212) 206-0499, FAX (212) 727-2495. Contemporary Posters was formed to introduce & establish contemporary graphic design posters as an art form in the U.S. In other countries, they long have been recognized and collected as art. Daniel Libeskind, the internationally acclaimed Polish-American architect, designer of the Jewish Museum, Berlin, was awarded a medal for excellence in architecture during the opening reception of the 2nd annual CYRK exhibit at the Polish Consulate in New York City. Accompanied by his wife, Nina, and their two children, the youthful-looking architect greeted the crowd in Polish. He then switched to English and eloquently addressed the question of his participation in the design of a museum of Jewish heritage in Berlin. He explained that for him, Germany is a country of a long and varied history of which the Holocaust is a devastating part. In Berlin, he has tried to build an architecturally interesting museum where all people will "find their heritage and hope." A 1970 graduate of Cooper Union, NYC; today Libeskind's well-respected firm deals predominately with cities' public spaces and buildings for cultural institutions worldwide. Some of his other noteworthy projects, in addition to Berlin's Jewish Museum, include the Victoria & Albert Museum extension, London; Jewish Museum, San Francisco; Felix Nussbaum Museum, Osnabruck, Germany and Imperial War Museum, Manchester, England. 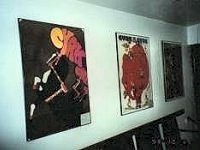 The CYRK exhibit, December 5th-12th, 1998, consisting of almost 100 different images by more than two dozen artists, was organized by Contemporary Posters, NYC. The posters, original 1970s award-winning graphic designs, are the most highly acclaimed and recognized posters of the world-famous Polish School of Posters. The Polish School of Posters (post WWII-1989) changed the face of contemporary poster design forever and set the standard others follow. All posters are linen-backed and were priced from $75 to $375. During the opening reception, guests also viewed a slide show featuring Libeskind's Jewish Museum, Berlin, and enjoyed tastings of imported Polish foods & drinks. Contemporary Posters was formed to introduce & establish graphic design posters as an art form in the U.S. In other countries, they long have been recognized and collected as art. "Polish Influence on the Arts" Panel Discussion is part of the 2nd Annual CYRK...Polish circus poster exhibit at the Consulate General of the Republic of Poland, 233 Madison Ave. (E. 37th St.), NYC, from December 5 to 12, 1998. Panelists are: Andrzej Dudzinski, artist & illustrator best known for his New York Times Op-Ed drawings; Keith Godard (moderator) principal designer of Studioworks, FIT professor, AGI (Alliance Graphique Internationale) member, design historian; Adam Holender, Director of Photography of more than 25 major films including I'm Not Rappaport, Midnight Cowboy, Smoke, A Price above Rubies; Ryszard Horowitz, photographer recognized for his "multi-image mindscapes" & use of digital imagery and Jan Kubasiewicz, graphic design professor Massachusetts College of Art. The exhibit of original 1970s award-winning CYRK graphic design posters, the most highly acclaimed & recognized posters in the world, represents over 100 different images by more than 35 artists from the world-famous Polish School of Posters. The Polish School of Posters (1950s-1980s) changed the face of contemporary poster design forever and set the standard others follow. Poster sales will benefit the "Scholarship for Americans" of The Kosciuszko Foundation (An American Center for Polish Culture). All posters are linen-backed and priced from $75 to $375. During the Awards Ceremony & Opening Reception on Friday, December 4th from 6-8:30PM. Waldemar Swierzy, a leading artist of the world-famous Polish School of Posters & Daniel Libeskind, an internationally acclaimed Polish-American architect will be honored for excellence in their art. Admission is free to all events. Contemporary Posters will be presenting the CYRK poster exhibit to introduce and establish contemporary graphic design posters as an art form in the U.S. In other countries, they long have been recognized and collected as the art investment for the future. CYRK posters will also exhibited at: La Belle epoque Vintage Posters, Inc., 280 Columbus Ave. (73th St.), NYC, (212) 362-1770. 'Taste of Poland' will offer complimentary tastings of imported Polish fine foods and drinks - everything from chocolates to vodkas - during Wednesday & Saturday matinees as well as at the Awards Ceremony & Opening Reception and Panel Discussion at the CYRK...Polish circus poster exhibit at the Consulate General of the Republic of Poland, 233 Madison Ave. (E. 37th St.), NYC, fromDecember 5-12, 1998. The 'Taste of Poland' during Wednesday & Saturday matinees will be on Dec. 5th, Dec. 9th & Dec. 12th from 12-2PM. "The 'Taste of Poland' & CYRK exhibit again represents a unique opportunity to experience in a single visit some of the best Poland exports: poster art and gourmet food. Viewing posters while sampling Polish preserves, ham, pickled fruits & vegetables, chocolates, juices and vodkas is an unsurpassable cultural experience." says Ryszard Klemm, Cultural Attach, of the Polish Consulate. The exhibit of original 1970s award-winning CYRK graphic design posters, the most highly acclaimed & recognized posters in the world, represents over 100 different images by more than 35 artists of the world-famous B. The Polish School of Posters (1950s-1980s) changed the face of contemporary poster design forever and set the standard others follow. Poster sales are for the benefit of the 'Scholarship for Americans' of The B (An American Center for Polish Culture). All posters are linen-backed and priced from $75 to $375. The Awards Ceremony & Opening Reception will be held on Friday, December 4th from 6-8:30PM. Awards will be presented for excellence in their art to B, a leading artist of the world-famous Polish School of Posters & Daniel Libeskind, an internationally acclaimed Polish-American architect. 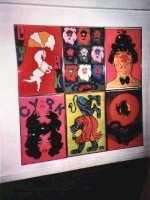 The CYRK exhibit will feature many of Swierzy's CYRK posters including his famous Clown face with derby (1970), the only CYRK poster issued as a postage stamp. This poster will be sold at silent auction during the exhibit. Also displayed will be some of Libeskind's projects: the new Jewish Museum in Berlin and the Victoria & Albert Museum extension in London. The Panel Discussion, 'Polish Influence on the Arts', will be held on Monday, December 7th from 7-9PM. The panelists are: Andrzej Dudzinski, artist & illustrator known for his New York Times Op-Ed drawings; Keith Godard (moderator) principal designer of Studioworks, FIT professor, AGI member; Adam Holender, Director of Photography of more than 25 major films including I'm Not Rappaport, Midnight Cowboy; Ryszard Horowitz, photographer recognized for his 'multi-image mindscapes' and Jan Kubasiewicz, graphic design professor Massachusetts College of Art. The 'Taste of Poland' is sponsored by: Adamba Imports Int'l Inc (Luksusowa vodka), Atalanta Corp (Podlaski cheese), Bacik Co (Bobak kielbasa), Cracovia Co (Cracovia fruits & vegetables, preserves, juices...) LOT Polish Airlines, Old Poland Bakery (original Polish rye bread), Palm Bay Imports Inc (Wodka Wyborowa), Polfoods Corp (Krakus ham), Polish Nt'l Tourist Office, & Plochman Corp (Kosciusko mustard). Contemporary Posters will be presenting the CYRK poster exhibit to introduce and establish contemporary graphic design posters as an art form in the U.S.; in other countries they long have been recognized and collected as the art investment for the future. CYRK posters will also be exhibited at: La Belle Epoque Vintage Posters, Inc., 280 Columbus Ave. (73rd St.), NYC, (212) 362-1770. Rafal Olbinski and Boguslaw Lustyk - well-known Polish-American artists - will be making guest appearances at the Contemporary Posters' exhibit in the new Contemporary Room of The International Vintage Poster Fair in New York City, October 23-25, 1998. Contemporary Posters will be featuring CYRK (Polish circus) posters by these two artists as well as other artists of the world-famous Polish School of Posters. Many of the CYRK posters will be exhibited for the first time in the U.S. CYRK posters are the most highly-acclaimed and recognized Polish post-World War II posters. In honor of Olbinski and Lustyk's visit, Contemporary Posters will hold a daily free raffle of one of their striking CYRK posters. Rafal Olbinski (b.1945) was one of Poland's more prominent posterists before 1981 when he emigrated to the USA. In New York City, his provacative surrealistic style swiftly achieved critical acclaim. His CYRK posters, designed in Poland, present a fascinating mix of fact and fantasy, often subtly commenting on society. Boguslaw Lustyk (b.1940) had attained an international artistic reputation before settling in Louisville, Kentucky. With horses one of his favorite subjects, he was chosen as the official Kentucky Derby Artist for the 124th Kentucky Derby (1998). Working in a variety of media, his art depicts diverse themes but consistenly conveys mood and movement. The Polish School of Posters (post-WWII until the fall of Communism [1945-1989]) changed the face of contemporary poster design forever and set the standards others follow. When it crossed the fine line between visual communication and art, it became a branch of contemporary art. The 20th International Vintage Poster Fair will be held at the Metropolitan Pavilion, 110 West 19th St., NYC; Friday 5-9PM, Saturday 10-7PM and Sunday 10-5PM. 31 exhibitors from Europe and the U.S. will participate. Waldemar Swierzy's award-winning 1970's CYRK... Polish circus posters are currently on view at Teresa's, a popular East Village restaurant, 103 First Avenue, New York City. Swierzy, a leader of the Polish School of Posters and Poland's most prolific graphic artist, has created nearly 2,000 posters including over 20 CYRK designs. His posters employ many different styles, often using unusual concepts to get viewer's attention and mirror Poland's social history. CYRK posters, the quintessence of the Polish School of Posters, convey the art of painting with the succinctness of the poster. They are artistic in intent, emphasizing strong, bold expression in a restrained, intellectual manner and thus, cannot be likened to their U.S. counterpart. This exhibit at of a limited number of Swierzy's CYRK posters will be on display at Teresa's through Spring. Teresa's, an established East Village restaurant specializing in Polish-American food at reasonable prices, has taken on a new spiffy look after a recent remodeling. The exhibit is organized by Contemporary Posters which offers more than 100 different CYRK poster designs by more than 35 different artists. All posters are sold linen-backed from $125 to $475. Andrew Russo, winner of Kosciuszko Foundation Chopin Piano Competition, performing a Chopin Recital. Admission free - Chopin Recital will be part of the "Arts Festival" & "Taste of Poland" during the CYRK...(Polish circus) poster exhibit at the Consulate General of the Republic of Poland, 233 Madison Ave., (E. 37th St.), NYC, from November 21-29, 1997. Andrew Russo is a young gifted pianist who "dazzles in recital". A handsome 22 year-old student at Julliard School of Music, NYC, he impresses his audience with both his technical command and brilliant renditions. Already a veteran performer, he has received rave reviews as well as numerous prizes and awards in addition to the 1996 Kosciuszko Foundation award. The evening will also include a "Taste of Poland" - complimentary tastings of imported Polish fine foods and drinks, everything from chocolates to vodkas. The Jazz recital is being sponsored by the Polish & Slavic Federal Credit Union. The exhibit of original, CYRK 1970s award-winning graphic design posters is the first in the U.S.; more than 100 different designs by more than 35 different artists from the world-famous Polish School of Posters will be available for sale. Posters are linen-backed and will be priced from $125. A percent of all poster sales will benefit the Scholarship Programs of The Kosciuszko Foundation (An American Center for Polish Culture). Additional CYRK poster exhibits will be at: the Chisholm-Larsson Gallery, 145 8th Ave. @ 17th St., NYC, which will also be showing selections from their contemporary Polish poster collection, and the Polish Art Gallery, 333 W. 38 St., NYC - from Nov. 21 to Dec. 31. Other admission free "Arts Festival" events during the CYRK exhibit at the Consulate include a Jazz recital, a Panel Discussion "Posters as Art" and a St. Andrew's Day Celebration. An Opening Reception for the Kosciuszko Foundation will be held on Friday, November 21st from 6-10PM. Awards will be presented to Rafal Olbinski & Jan Sawka, two world-renown Polish-American artists. Contemporary Posters is presenting the CYRK poster exhibit to introduce and establish contemporary graphic design posters as an art form in the U.S; in other countries, they are collected as art and have been long recognized as the art investment for the future. A CYRK...(Polish circus) poster exhibit will be held at the Consulate General of the Republic of Poland, 233 Madison Ave., (E. 37th St.), NYC, from November 21-29, 1997. A Preview Benefit for the Design League of Cooper-Hewitt, National Design Museum, Smithsonian Institution, will be held on Thursday, November 20th, from 6-9PM. For information and tickets, contact Pamela Haylock, phone (212) 849-8341. An Opening Reception for the Kosciuszko Foundation will be held on Friday, November 21st from 6-10PM. Awards will be presented to notable Polish-American graphic artists, including Rafal Olbinski & Jan Sawka. An "Arts Festival", a week of Polish-American artistic events, is being arranged by Contemporary Posters and The Kosciuszko Foundation (An American Center for Polish Culture). "Arts Festival" events to be held during the CYRK exhibit at the Consulate include: a Panel Discussion: "Posters as Art" - AIGA/NY Nite (panelists: Robert Chisholm, Seymour Chwast, Frank Fox, Steven Heller, Christopher Mount & Rafal Olbinski); Chopin Pisno Recital featuring Kosciuszko Foundation Chopin Piano Competition winner Andrew Russo; Jazz Recital with Krystof Medyna & "Breakwater" and a St. Andrew"s Day Celebration featuring dancers, fortune tellers...of the Polish American Folk Dance Co.
A percent of all poster sales during the exhibit will benefit the Scholarship Programs of The Kosciuszko Foundation. Posters are linen-backed and will sell for $125 to $275. A "Taste of Poland", complimentary tastings of imported Polish fine foods and drinks - everything from chocolates to vodkas, will be held during the Opening Reception and "Arts Festival" events. Additional CYRK poster exhibits will be at the Polish Art Gallery, 333 W. 38 St., NYC, & the Chisholm-Larsson Gallery, 145 8th Ave. @ 17th St., NYC, from Nov. 20-Dec. 31. 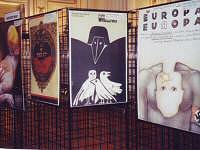 A traveling exhibit of CYRK posters is planned for 1998. Admission free - Jazz Recital will be part of the "Arts Festival" & "Taste of Poland" during the CYRK...(Polish circus) poster exhibit at the Consulate General of the Republic of Poland, 233 Madison Ave., (E. 37th St.), NYC, from November 21-29, 1997. Krystof Medyna is a renown jazz saxophonist and a founder of 'Breakwater', a fusion jazz group; the unique 'Breakwater' sound blends its Polish roots with the vibrancy of American jazz and the energy of rhythm & blues. Medyna & 'Breakwater' have toured internationally, garnering critical acclamation and a loyal popular follwing. Other admission free "Arts Festival" events during the CYRK exhibit at the Consulate include a Chopin piano recital, a Panel Discussion 'Posters as Art' and a St. Andrew's Day Celebration. An Opening Reception for the Kosciuszko Foundation will be held on Friday, November 21st from 6-10PM. Awards will be presented to Rafal Olbinski & Jan Sawka, two world-renown Polish-American artists from the 1970s Polish School of Posters. CYRK...(Polish circus) poster exhibit at the Consulate includes "Taste of Poland" & "Arts Festival"
"Taste of Poland " will offer complimentary tastings of imported Polish fine foods and drinks - everything from chocolates to vodkas - at the "Arts Festival", Opening Reception and Preview Benefit during the CYRK...(Polish circus) poster exhibit at the Consulate General of the Republic of Poland, 233 Madison Ave. (E. 37th St.), NYC, from November 21-29, 1997. "For New Yorkers and out-of-towners alike, the 'Taste of Poland' represents a unique opportunity to experience in a single visit some of the best Poland exports: CYRK posters and gourmet foods. Sampling Polish preserves, ham, pickled fruits & vegetables, cheeses, fruit drinks, chocolates and beers is a taste sensation that even the French can't equal. In Poland, the birthplace of vodka more than 600 years ago, leading Polish vodkas are made from Baltic-grown potatoes, rather than corn or rye, which accounts for its sweet taste." says Ryszard Klemm, Cultural Attache, of the Consulate. The Opening Reception will be held on Friday, November 21st from 6-10PM. Awards will be presented to Rafal Olbinski & Jan Sawka, two world-renown Polish-American graphic artists. The Preview Benefit for the Design League of Cooper-Hewitt, National Design Museum, Smithsonian Institution, will be held on Thursday, November 20th, from 6-9PM. For information and tickets, contact Pamela Haylock, phone (212) 849-8341. The CYRK exhibit of original, CYRK 1970s award-winning graphic design posters is the first in the U.S.; more than 100 different designs by more than 35 different artists from the world-famous Polish School of Posters will be available for sale. Posters are linen-backed and will be priced from $125. A percent of all poster sales during the exhibit will benefit the Scholarship Programs of The Kosciuszko Foundation (An American Center for Polish Culture). The "Taste of Poland" & "Arts Festival" sponsors include: Adamba Imports Int'l Inc., Atalanta Corp., Brooklyn Imports Inc., CITIBANK, FINNAIR, Palm Bay Imports Inc., Polfoods Corp., Polish National Tourist Office in NY, Polish & Slavic Federal Credit Union, Plochman Corp., Pulaski Products Co. Inc., Slodycze Inc., Stanley Stawski Dist. Co. Inc.